Outdoor Instagram sometimes feels like an echo chamber. #adventure #explore #mountains et al. There’s a word for the numbing side of Instagram: #simulacrum. A simulacrum is a copy of a copy. 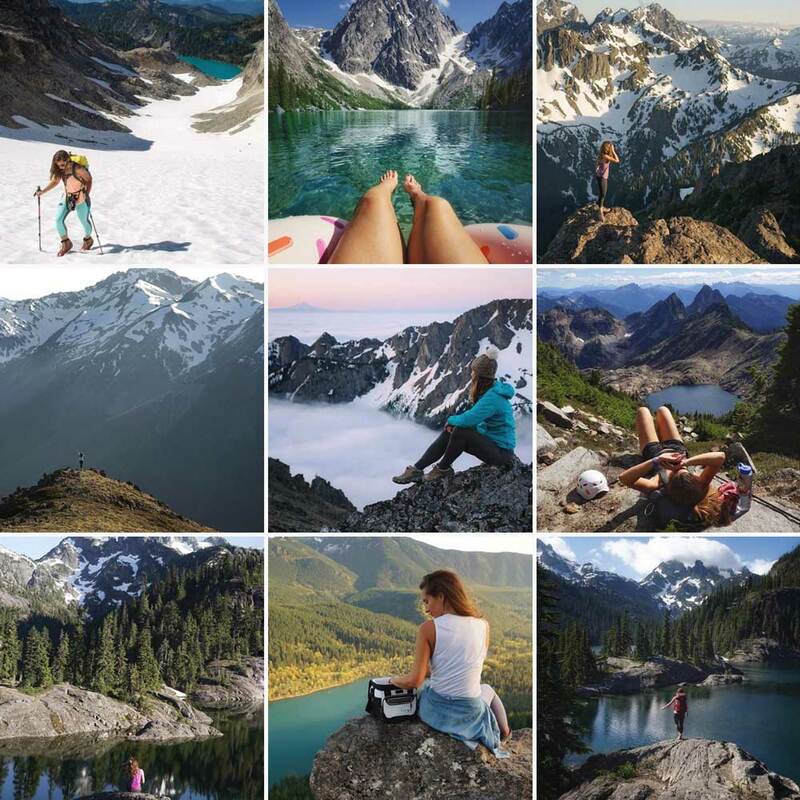 It is another picture of red-jacketed Instagram influencers in front of a deep blue lake at the seat of jagged snow-capped peaks. There is nothing wrong with this image; it is beautiful. But copied enough times and it loses its power to inspire. This article is not about the echo chamber; it is about the high-profile people who cut through the noise. 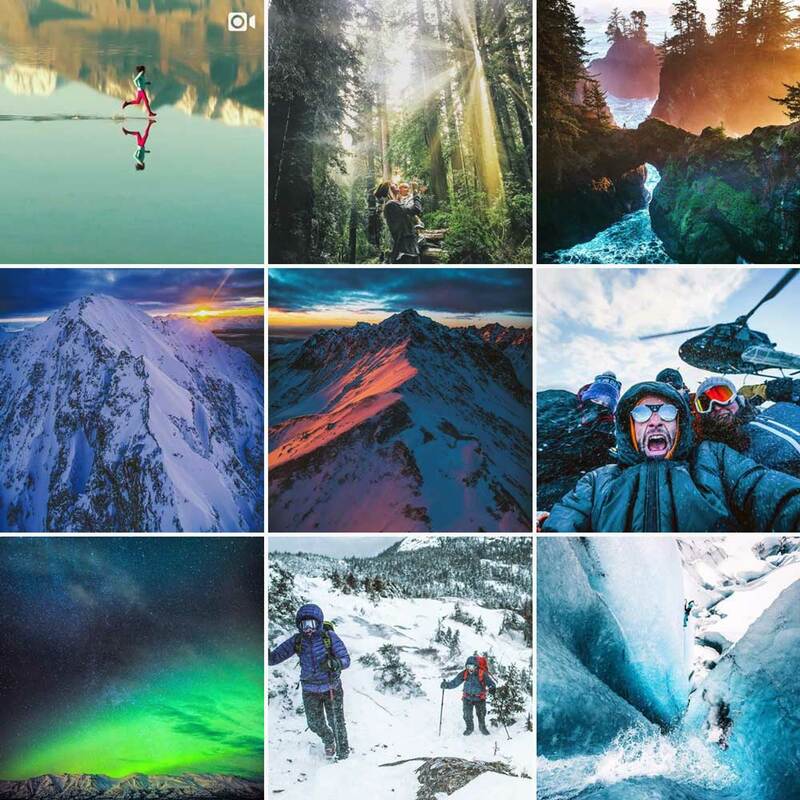 Here are over 70+ adventurers who, through large followings and true voices, direct the lifeblood of outdoor Instagram; who keep it alive, awake, and authentic. This was a massive undertaking, but it was also eye-opening. It showed me that, for many of us, the outdoors is the arena of our lives. It is not just about this photo, or this hike, or this campsite. Taken in sum, it’s home. 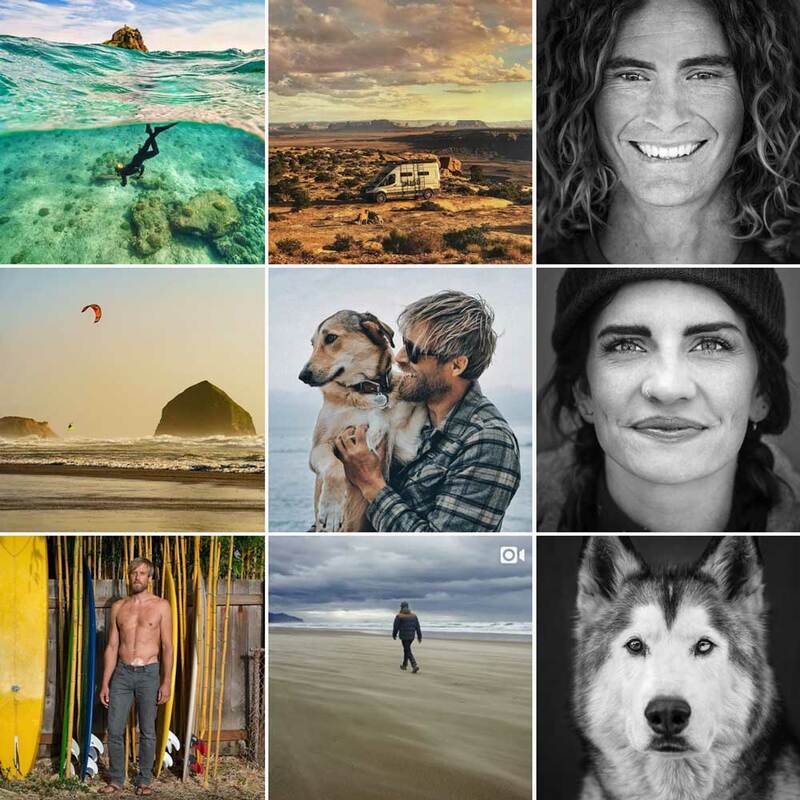 With each of these Instagram influencers, you are looking into lives. 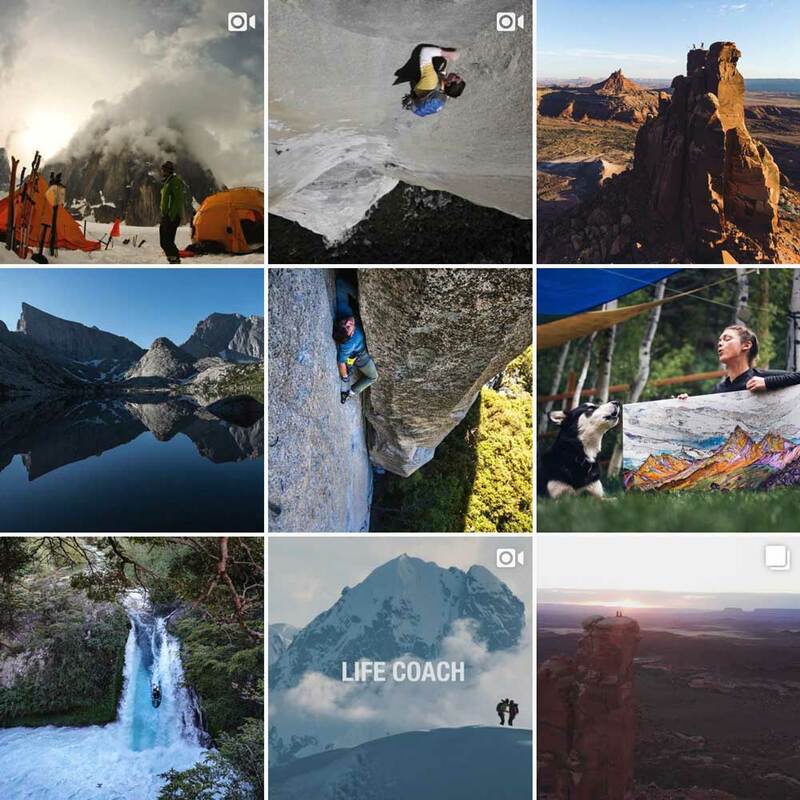 Everyone here is chasing passions, battling demons, voicing issues, and encouraging their audience to get outside. Just as there is no ranking to the variety of views on a winding mountain pass, there is no order to what you see here. As you make your way along this road, some sights will stop you in your tracks, others less so, and each of us in different degrees. Was it worth staring at Instagram for hours on end to find all these influencers? Absolutely. Did I find everyone who’s worth following? Absolutely not… Please send me a message @ryanfliss if you think someone should be included. For now, it’s time to spend some time away from screens. I hope you enjoy this list, and embrace your own version of the awe I felt in learning about all these incredible people. Caroline is an example of life lived with intent. 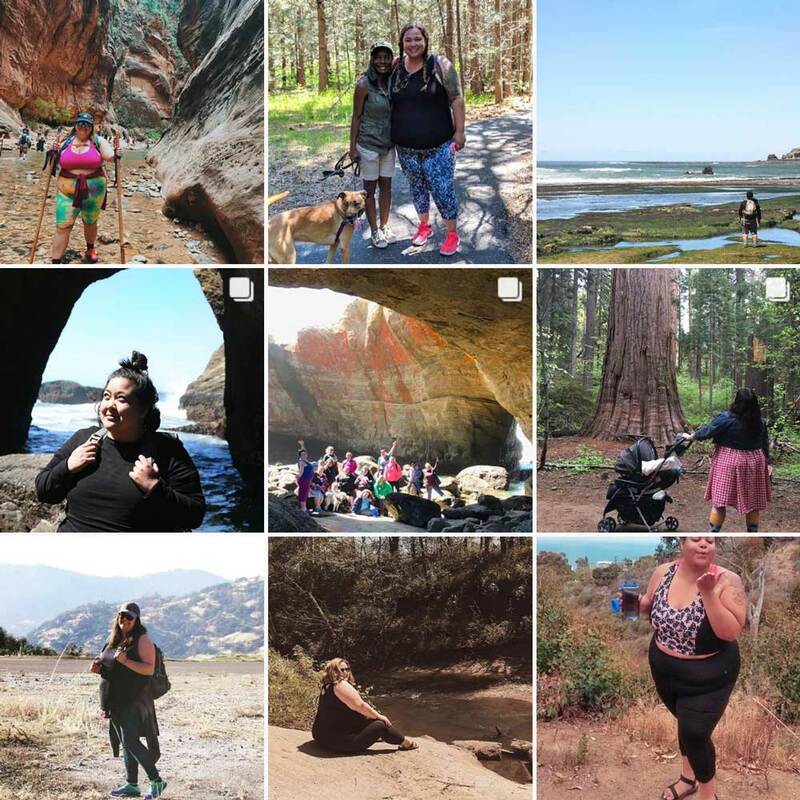 She sets massive goals and shares the journey to the next big peak, all the while fighting to protect what matters most to her — a lot of which probably also matters significantly to you. When I look at some photographers’ work, I can almost see the moments they put down the camera and stared in awe, appreciating everything in sight. 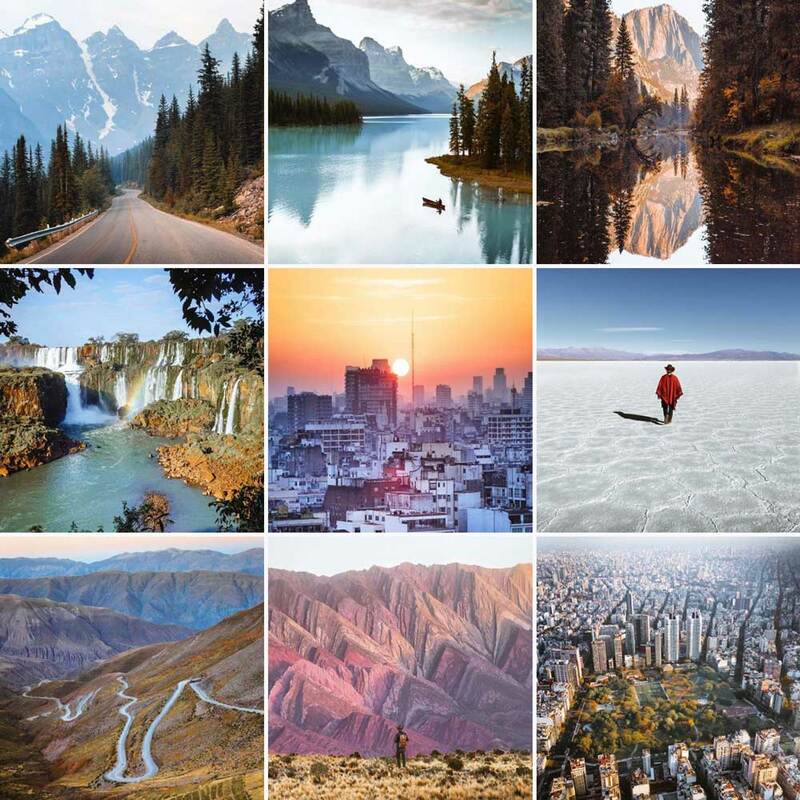 Andy Best is one of those Instagram influencers with an eye, and his photographs take you to that place of admiration, with captions to match. 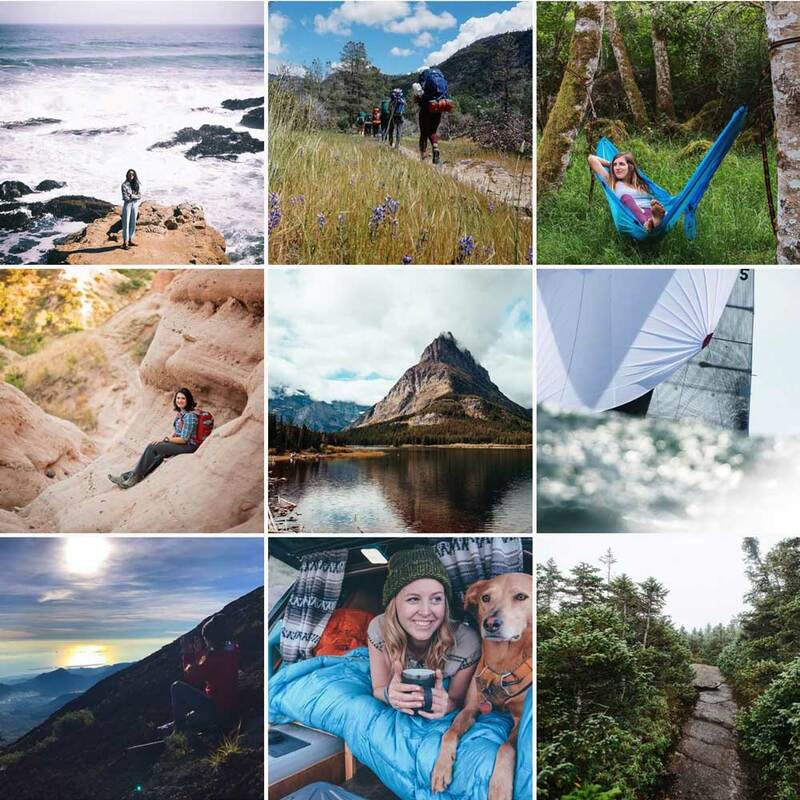 @youdidnotsleepthere keeps Instagram lighthearted, featuring photos that we all might have looked at and said, “…but did you actually sleep there though?” Related: Leave No Trace just released social media guidance to mitigate effects on nature from people going a little too far for the ‘gram. Worth a read. Life on the road, with less metaphorical filter than you’re probably used to. Trust me: that’s a good thing. The Dyrt is the #1 app for locating campsites, with the most campground reviews & photos in the US. Available now on Android and iOS. 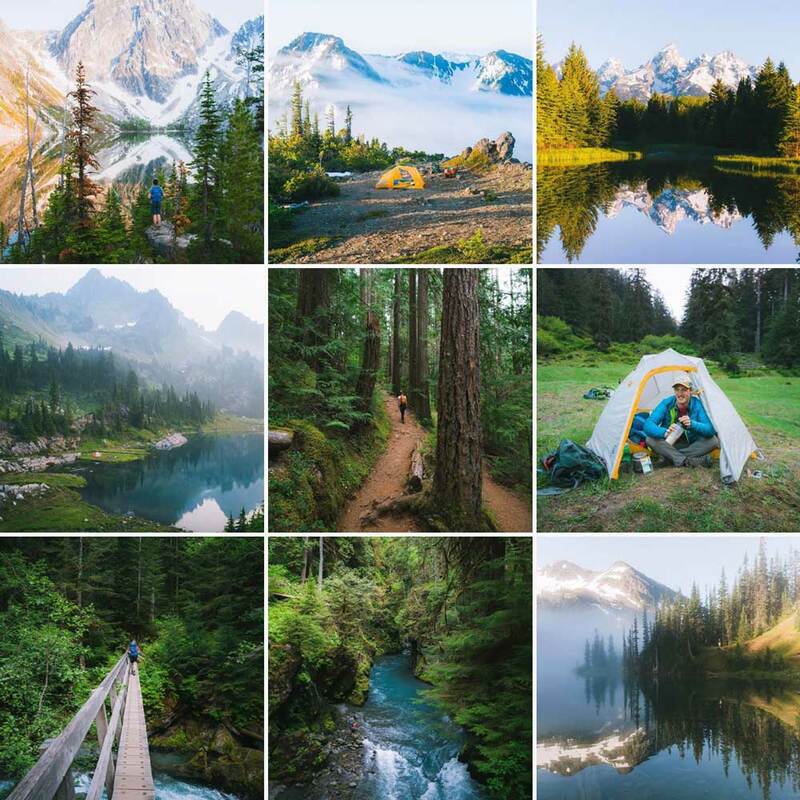 Aiden White’s photography captures the type of fleeting moments in the great outdoors that bring us all closer together. 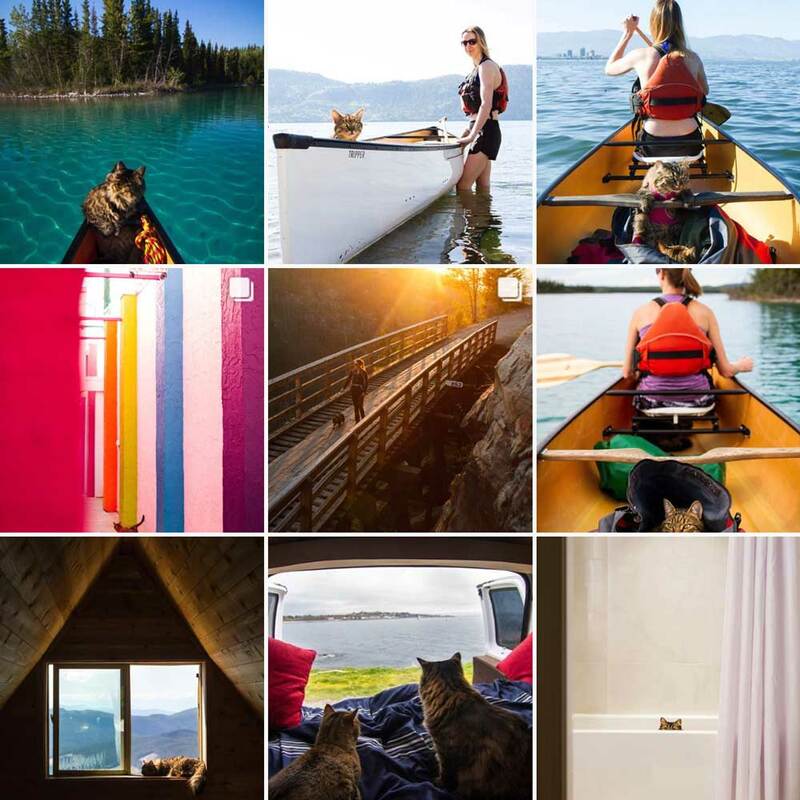 @tinyhousetinyfootprint is Kathleen Morton’s homage to low-impact life on the road. She captures the inimitable moments from her own journey, and introduces followers to others forging their own path. Wherever you are, @alexandriaroby’s often iconic photography offers viewers a breath of fresh air. 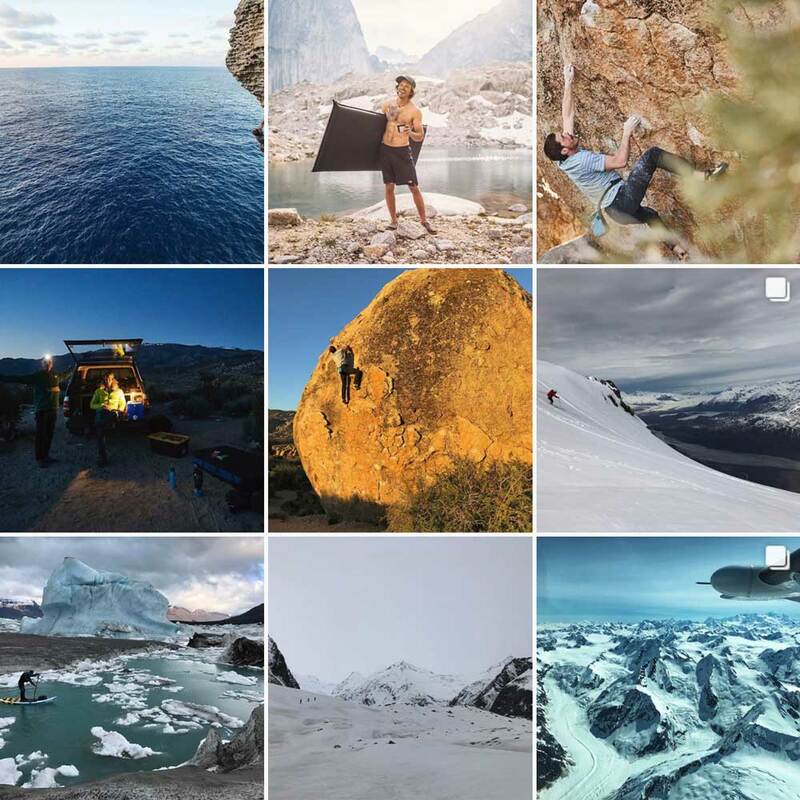 Ben Moon is a sui generis visual storyteller. 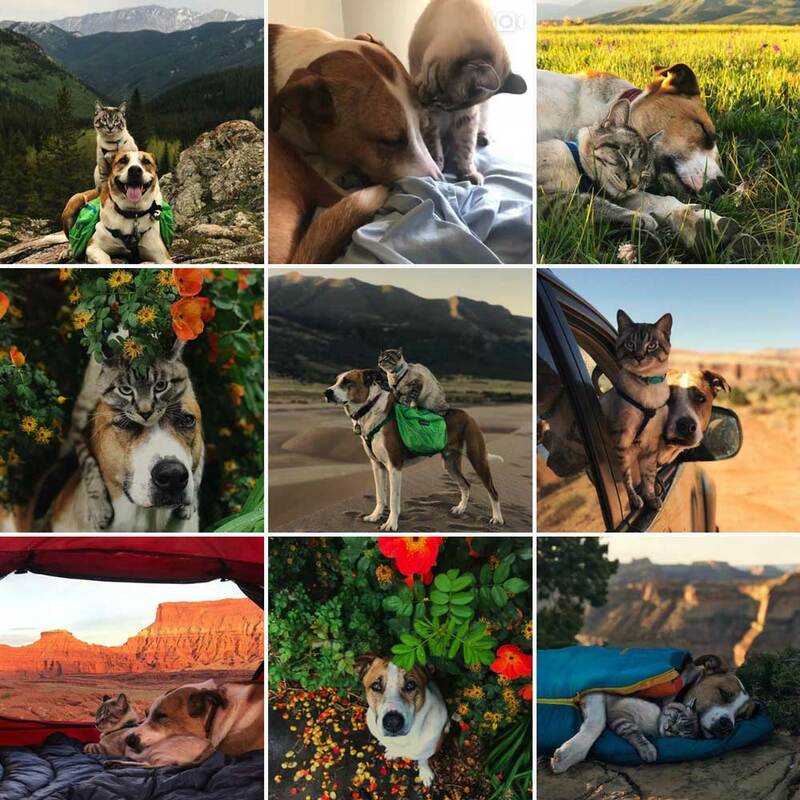 You may have seen his short film, Denali—a touching and intense tribute to his late pup of the same name (Heads up: Our whole team cried as we re-watched Denali this winter). 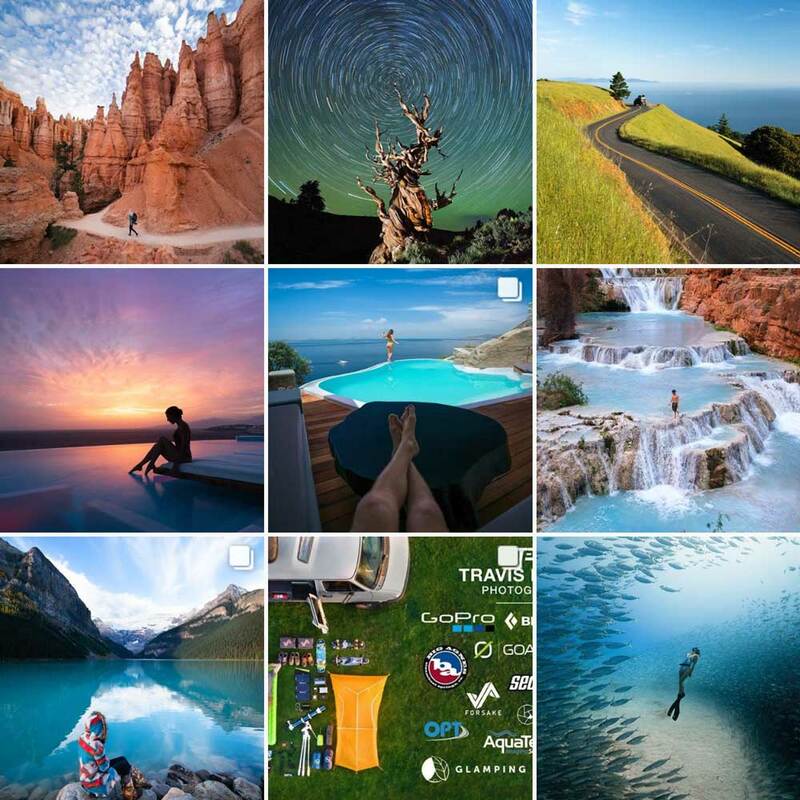 He uses his account to share insights from his life and highlight other Instagram influencers who do the same. 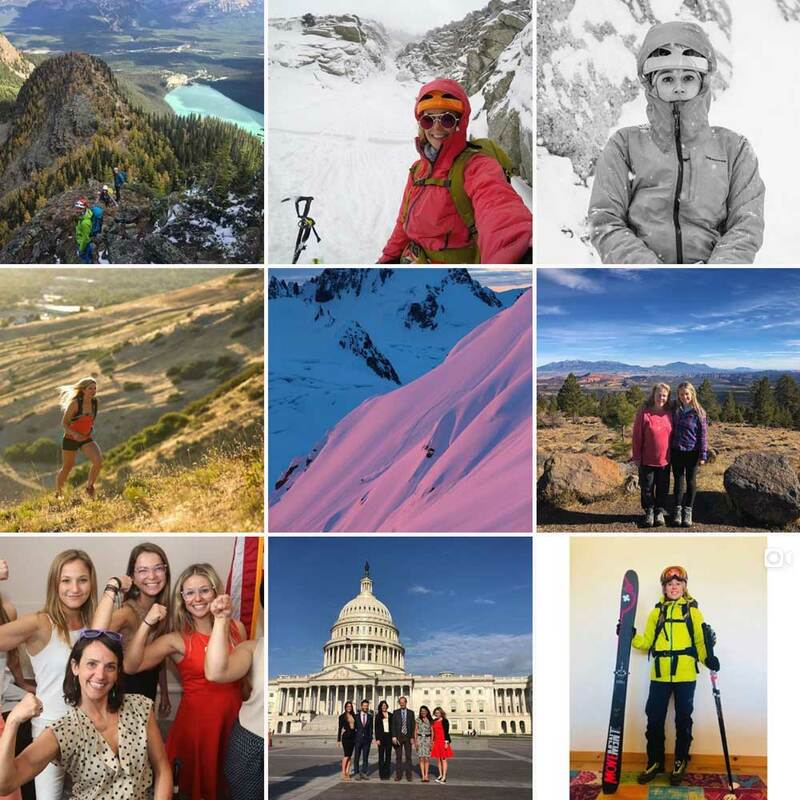 Katie Boué is a name well known in the outdoor industry, but for those who don’t know, she’s a champion of little moments and doing big things right. Following Katie is like making a new friend who’s always doing that cool thing you’ve thought about trying, but didn’t know where to start. She offers valuable insight on how you can do those cool things while respecting, cherishing, and championing for the places we love to explore. A life well lived makes joy in every moment possible, and @andrew__muse is a constant reminder that the moments are there, waiting for you to participate. 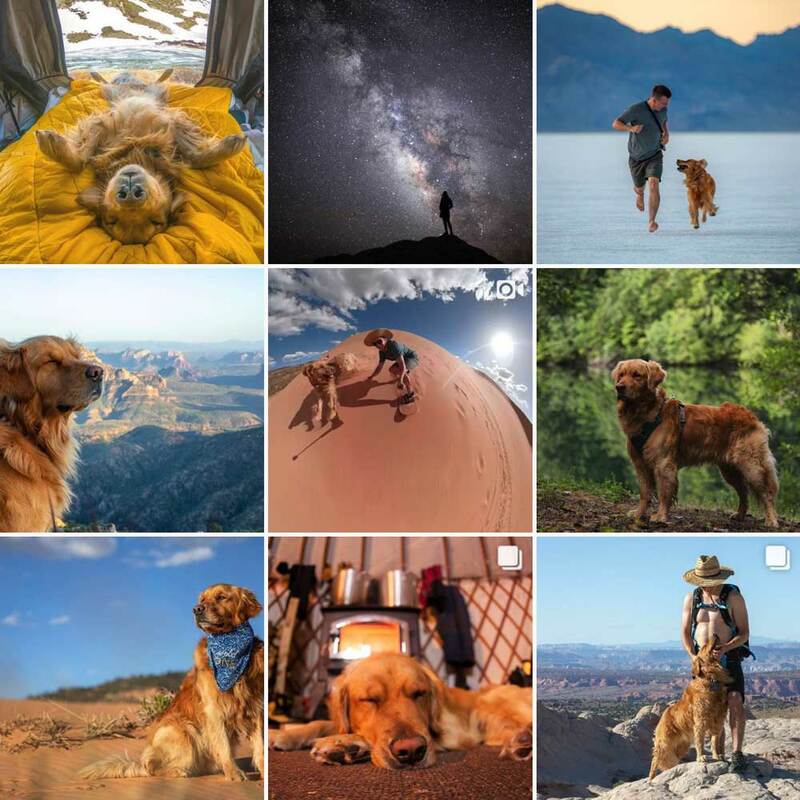 Andrew and Kicker the dog are two Instagram influencers you don’t want to miss in your feed. I frequently find myself wanting to be where @nathanaelbillings is, but what’s more, his views somehow feel attainable. Like if I just planned a little better, I CAN see what he’s seeing. And that little nudge of motivation can go a long way. 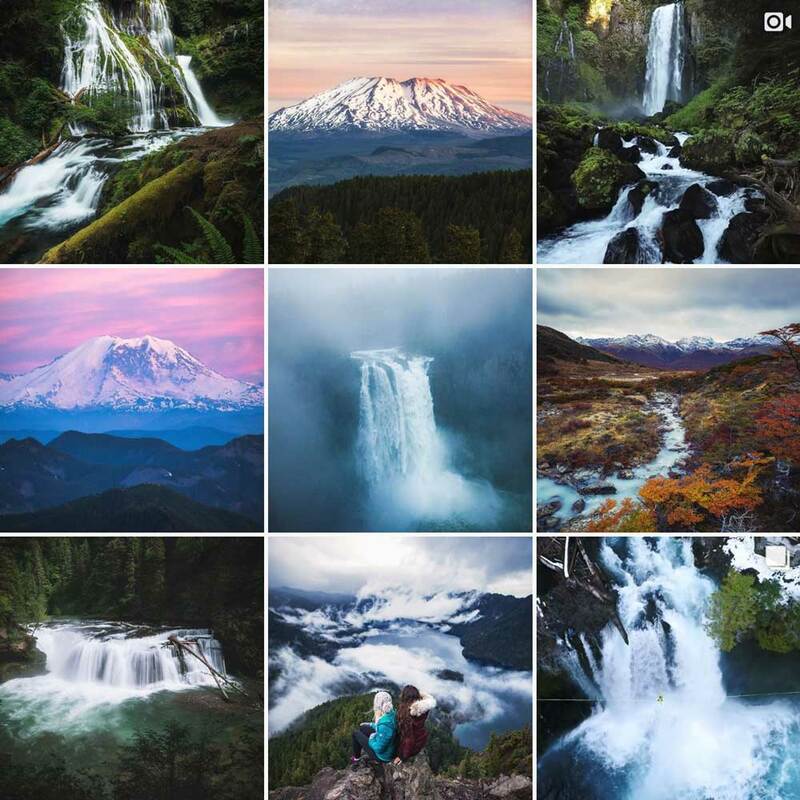 Some of the very best of the Pacific Northwest, there is always wonder to be found in the photographs featured by @pnwonderland. –me, every time @tedhesser shares a new post. A lot of people come to Instagram to go somewhere else. Wherever he is, @timkemple will take you there. 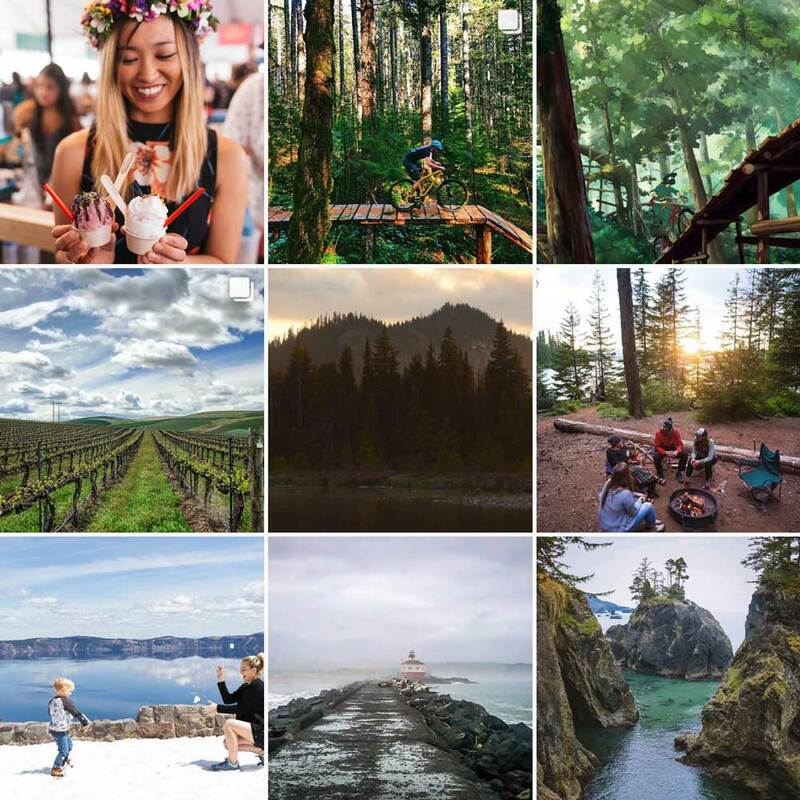 Yes I would like to visit the PNW, thank you very much. But also, the PNW is huge and I will not be able to visit most of the PNW for quite some time. 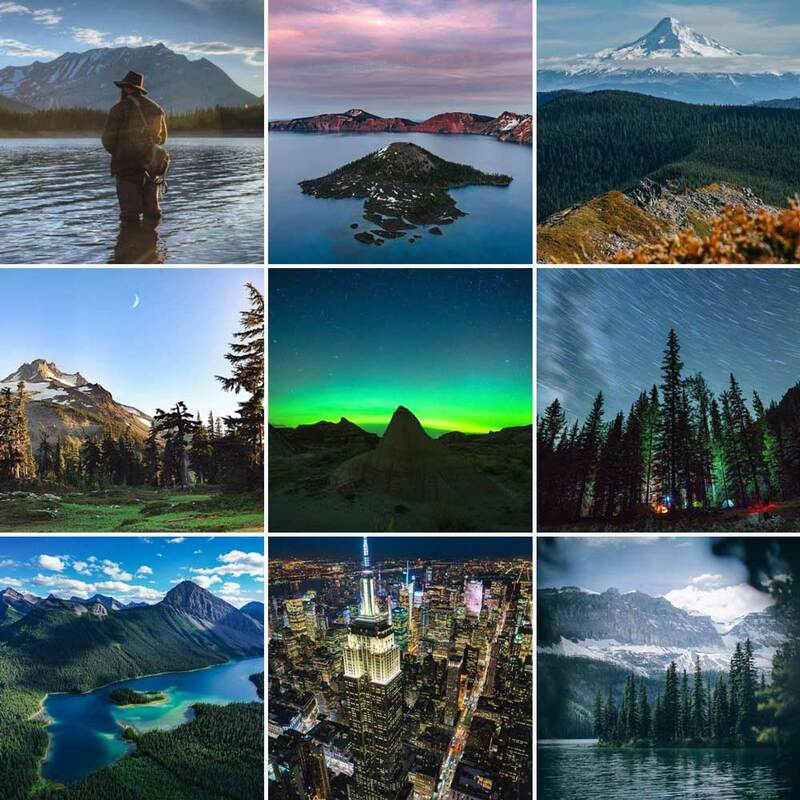 So, while I still have a lot of places on my to-visit list, @visitpnw is a great stand-in reminder of all the incredible beauty that abounds. 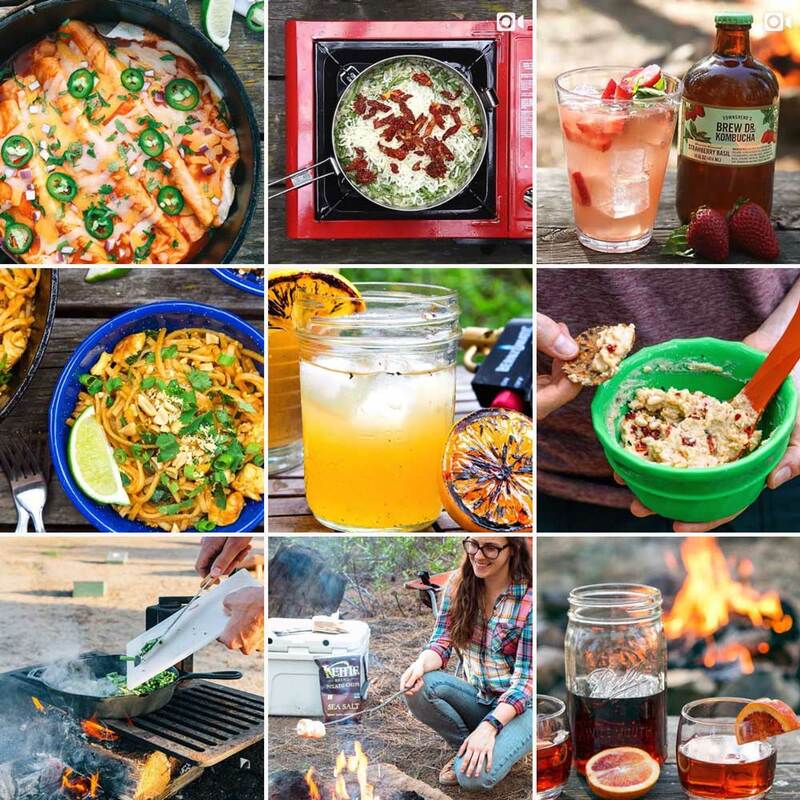 @bradleycastaneda shares some of the most incredible imagery on Instagram, and also shares his campfire taco dinner. Authenticity. We need more of what Bradley’s serving (tacos, yes, but here I’m referring to the Authenticity). Oh man. No words. You already got the message. “When you put your bones and tears and sweat into finding a place, you treat it differently. 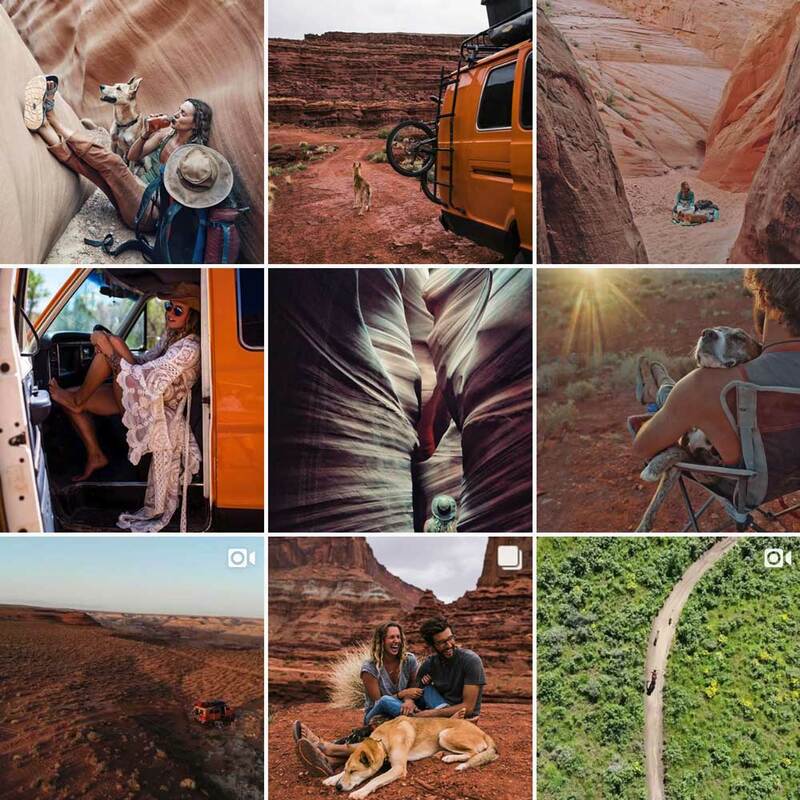 You respect it more because you worked for it and gave a part of yourself to it.” –Brianna Madia in an interview, Life in a Van in the Middle of Nowhere. Brianna and Keith with pups Dagwood and Bucket, and of course Bertha the van, together live a life that is both refreshing and very much their own. 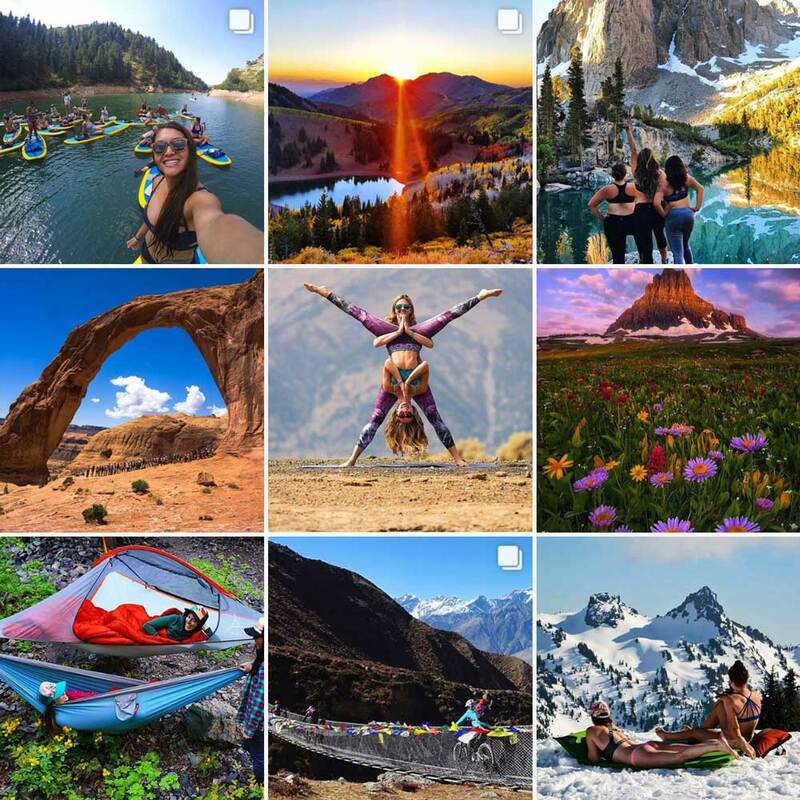 As one of the most popular Instagram influencers in the outdoors, Brianna’s captions alone are worth a devoted afternoon. Dogs can’t put on airs, so photos of them in the wild are always authentic. 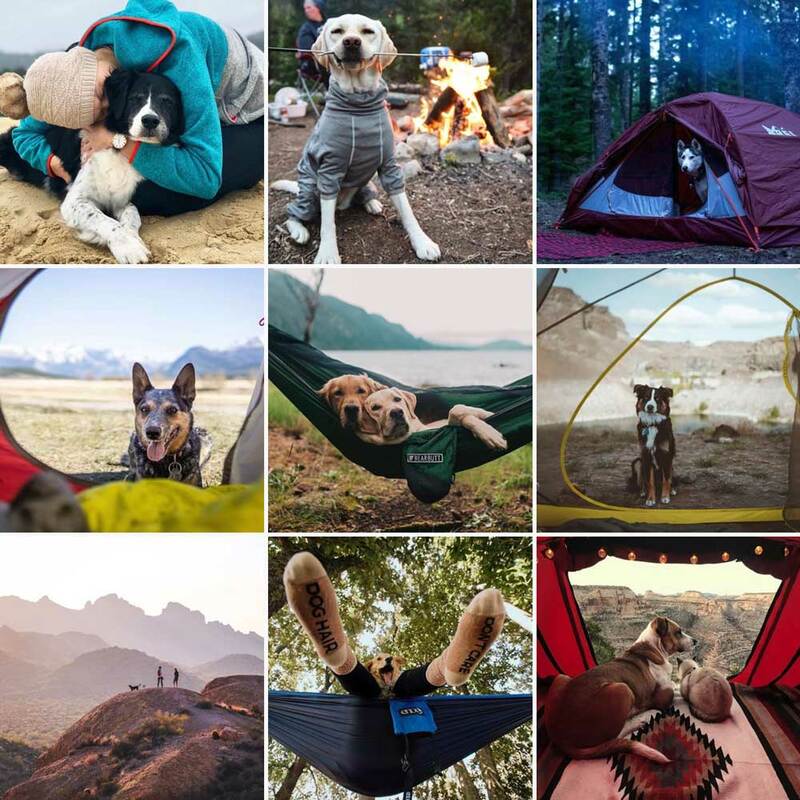 Camping with Dogs is exactly what it sounds like, and the joy this account brings to Instagram is undeniable. 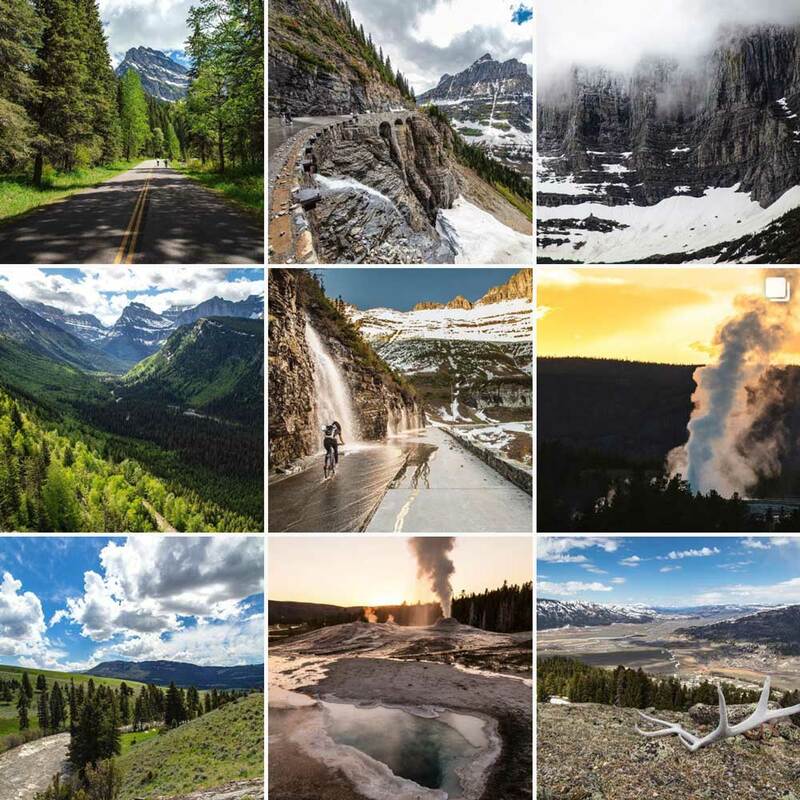 Dedication to place is a rare gift in our age of see-it-all aspirations, and @jacobwfrank’s dedication to Yellowstone provides an important glimpse into this icon of outdoor americana. 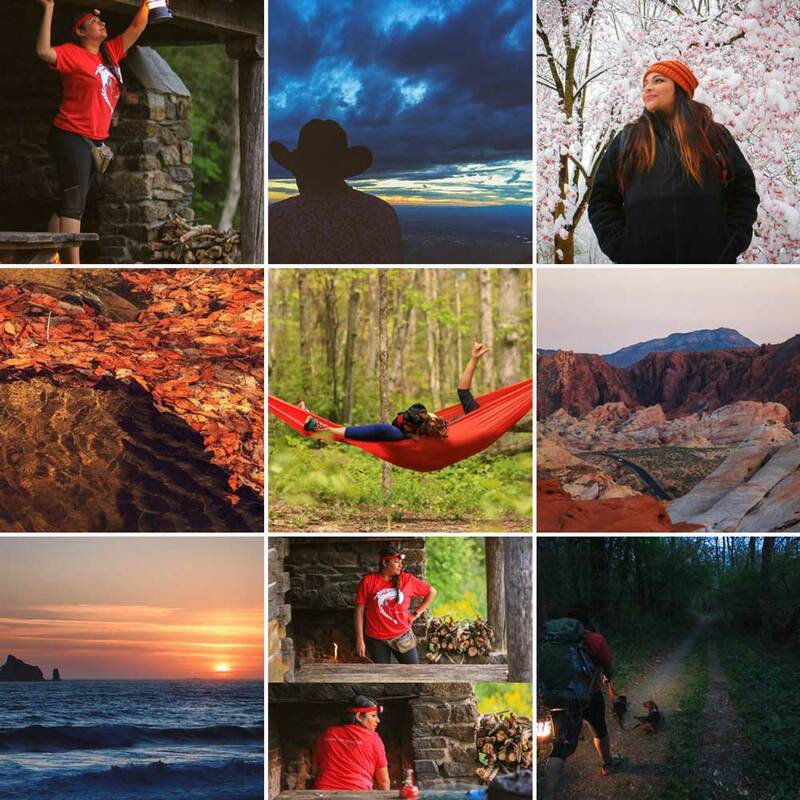 Anyone who loves the outdoors, travel, and friends is almost definitely a person worth following in my book. 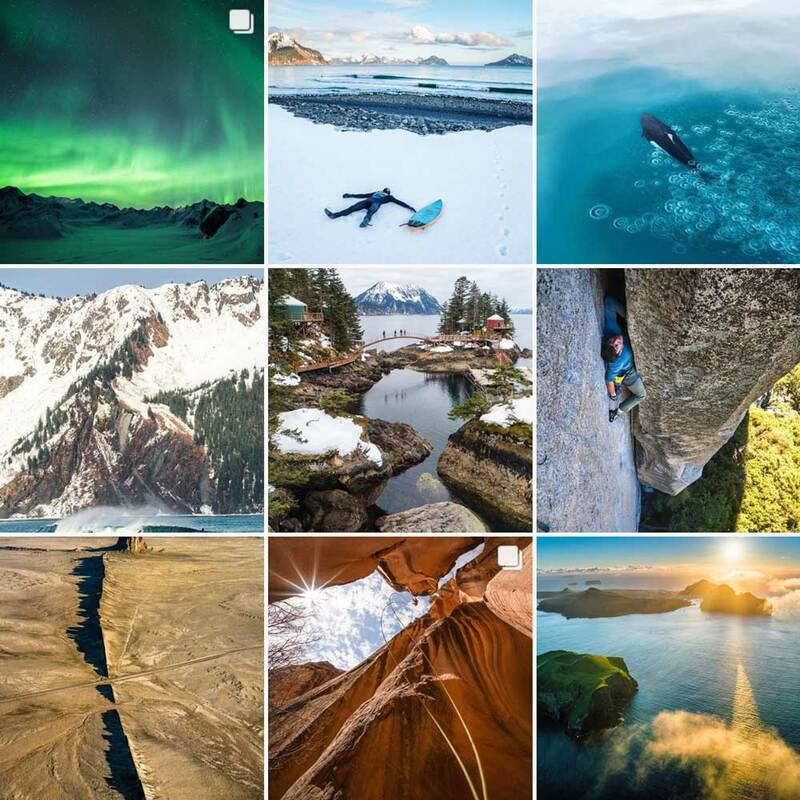 A Nat Geo Explorer, Nat Geo Exploring… from SUPing through glacier-ridden waters to boulder top-outs with friends, @mattsegal brings the eye-popping photographic stoke. 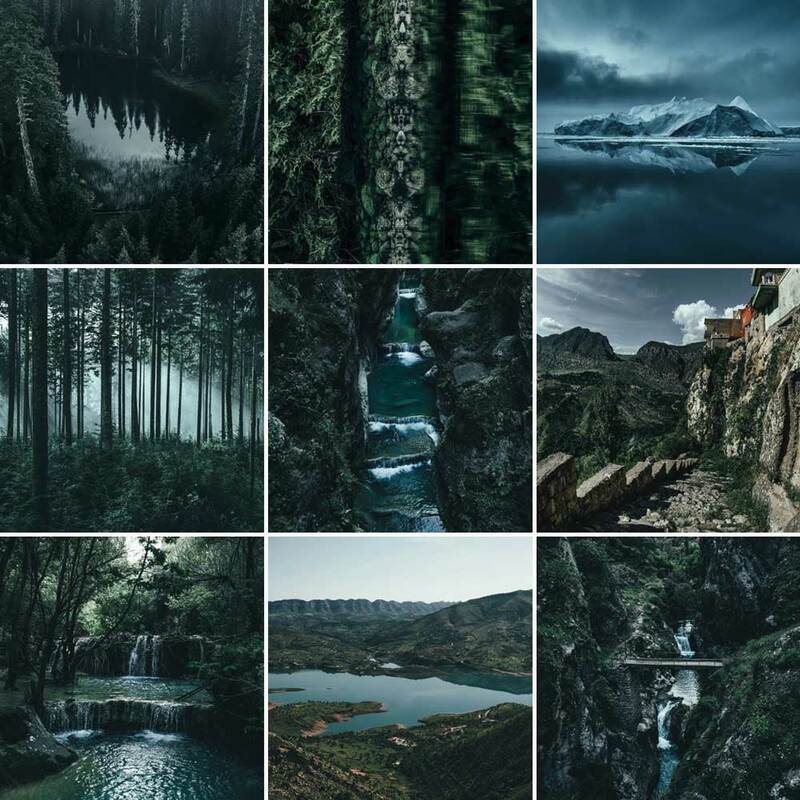 The stories told by @alexstrohl are followed by millions, and for good reason: every new post is new slice of outdoor amazement balanced with Alex’s behind-the-scene perspective. I met @chelseakauai in Lihue Airport on the southeast coast of Kauai. We were both leaving, she posted a story about being at the airport, and I said it’d be cool to connect. Meeting Chelsea, you would never know she is one of the biggest Instagram influencers, followed by hundreds of thousands of people — but you might suspect it. She is always off to a new place, yet remains steadfast in her admiration of Kauai. Her latest venture: a book club with her followers, complete with private Facebook group. 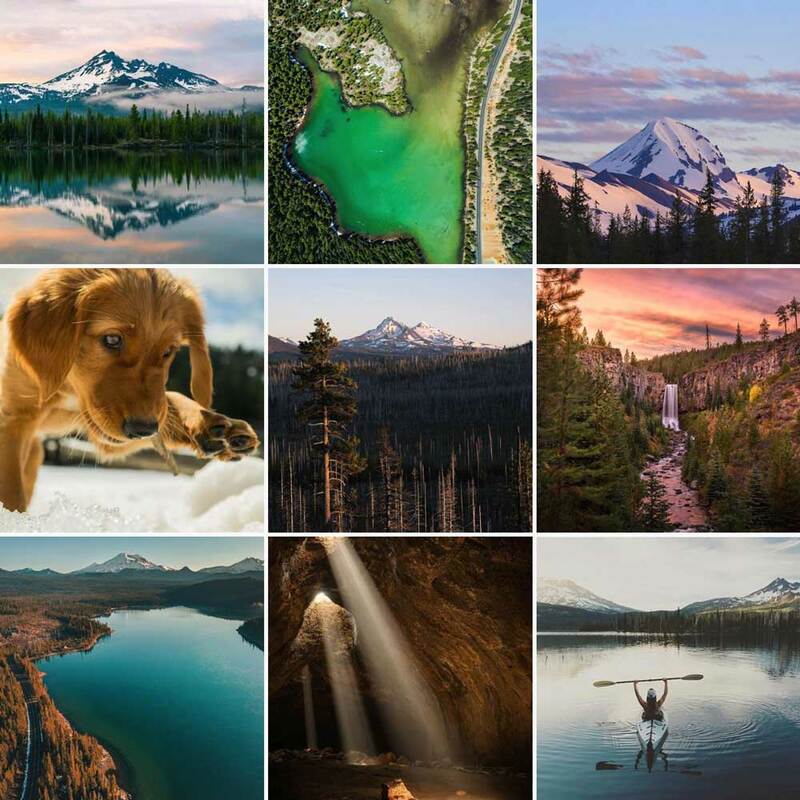 @michaelmatti’s feel-good photography evokes the possibility of an early morning sunrise: there is so much good to come, and it’s already wonderful. @wheretowillie comes across as the type of person who circles “Sunrise” on the calendar. There’s intent behind his photos, a forethought that comes through not just in framing and composition but in the overall “feel” — the undeniable sense that you’ve been invited on an adventure, but only because he chose to bring the camera. As the co-founder of @pnwoutdoorwomen, @missmeghanyoung not only portrays authenticity, she creates it in the communities around her. 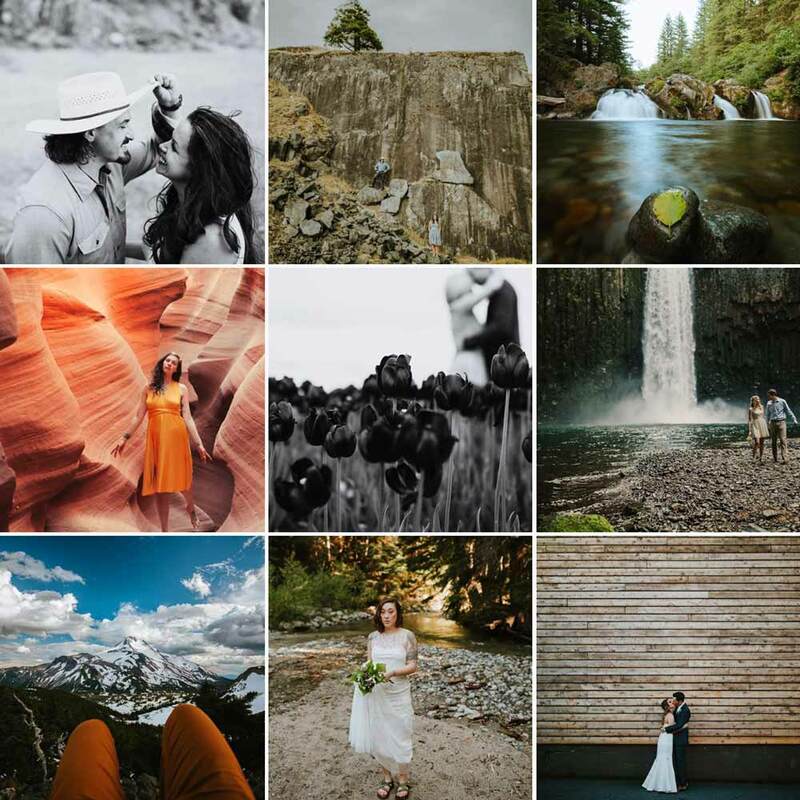 Her captivating captions delve into topics others opt out of (even on an engagement-first platform like Instagram.) And that’s exactly what pushes her posts from great to incredible. 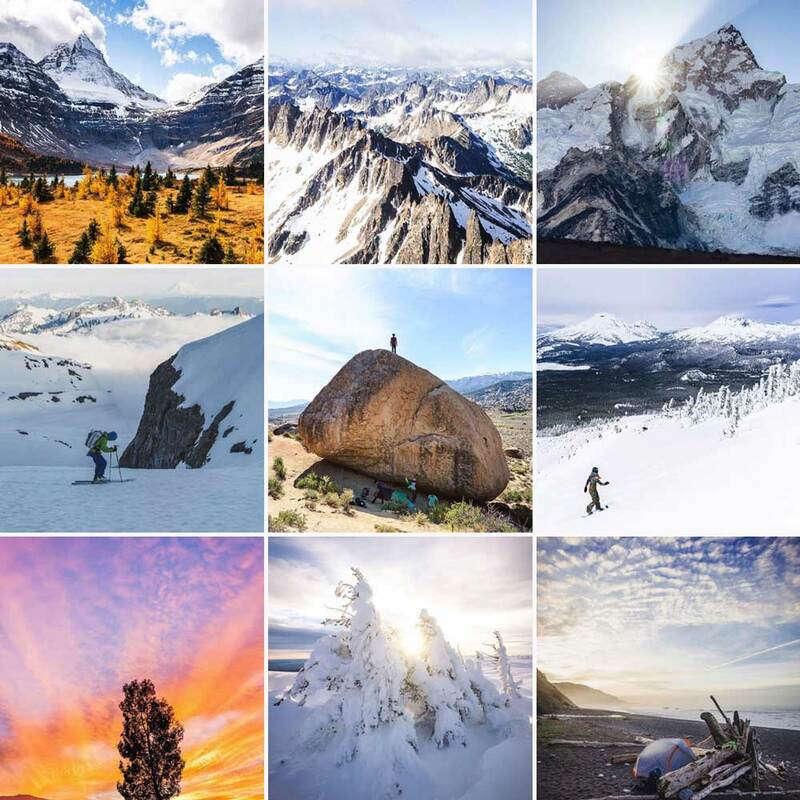 You probably know about @chrisburkard, one of the bigger outdoor Instagram influencers. 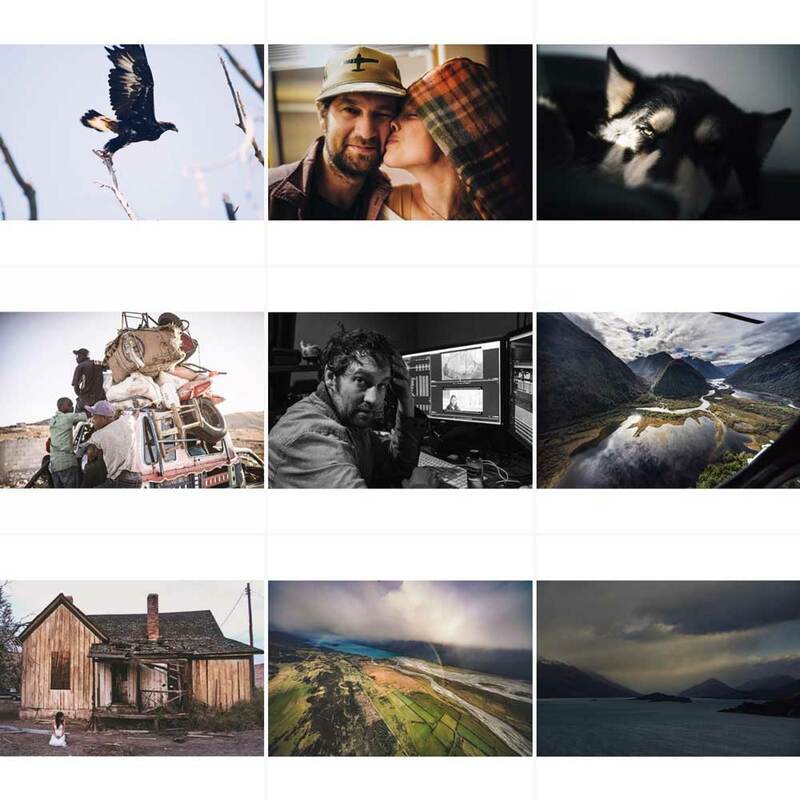 His photos are all over Instagram and the web writ large. But what strikes me more than his photos is his candor and commitment to play. He’s just a dude. A really talented photographer, yes, but also a father who shares things that make him laugh or smile or stop and stare. If you follow his account, you’ve seen this candid side of his profile in his Instagram Stories, which, to me, increase his photographic impact tenfold. 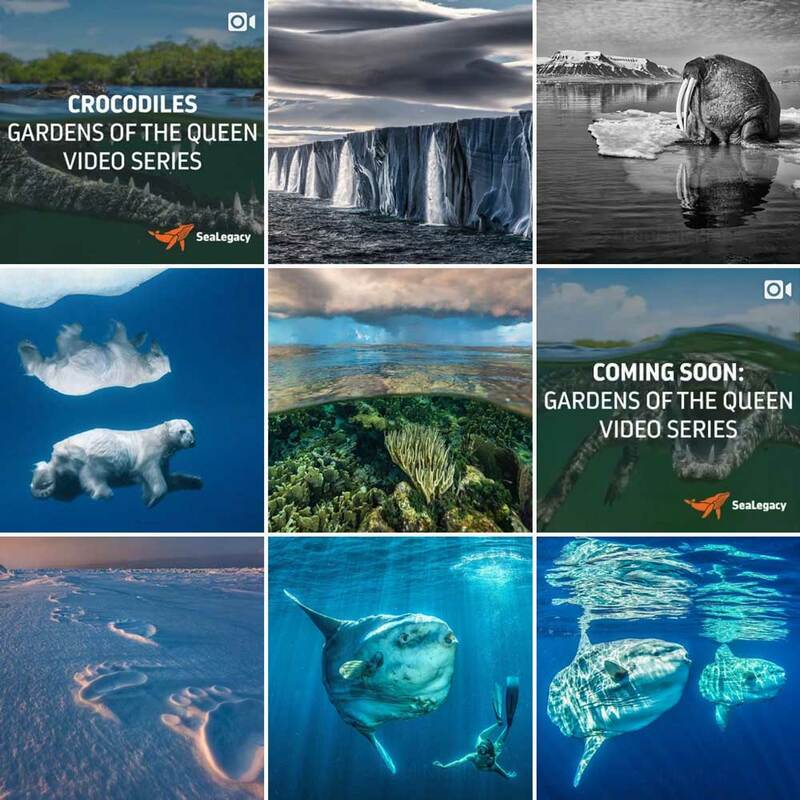 @everchanginghorizon has found a massive following for his incredible photography, but it is clear he is a photographer first, and social media personality second. He does it for the experiences and takes photos along the way, never pretending to be something else: “Sitting here thinking about what I should write here, and I’ve come to determine that everything’s been said. My few life lessons have already been shared, reshared, stretched, exaggerated, etc. It’s important for me to remember that what I write here doesn’t always have to have substance (tho I try to add it when it feels right). My experiences and words are no more valuable than anybody else’s. If I really think about it, it overwhelms me. Hundreds of thousands of people’s attention at my fingertips – the digital spotlight is on – but it’s been on for years now. And the spotlight can only be on for so long before my eyes start to hurt. So here’s another photo of a happy time, when I had no connection. Half way thru a mac n cheese dinner, about ready to call it an early night.” It’s a reminder worth heeding. 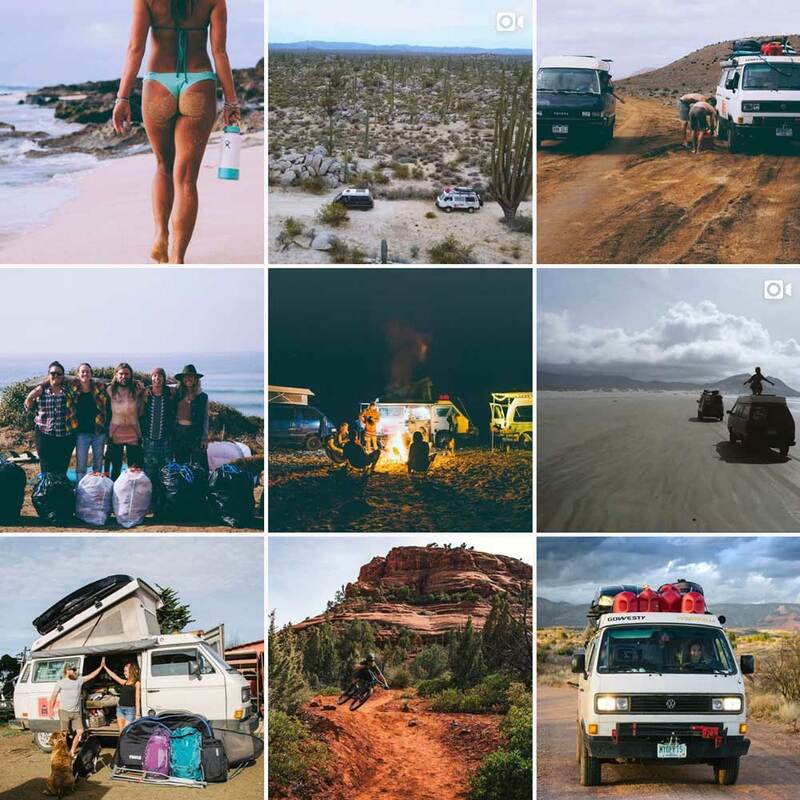 As you can see, @fursty’s feed looks different, and on Instagram, difference often hints at authenticity. He goes one step beyond visual branding, incorporating locations and viewpoints that elevate his impact even further. Most recently, his trip to Iraq returned photos that might as well have been from Utah or the PNW. 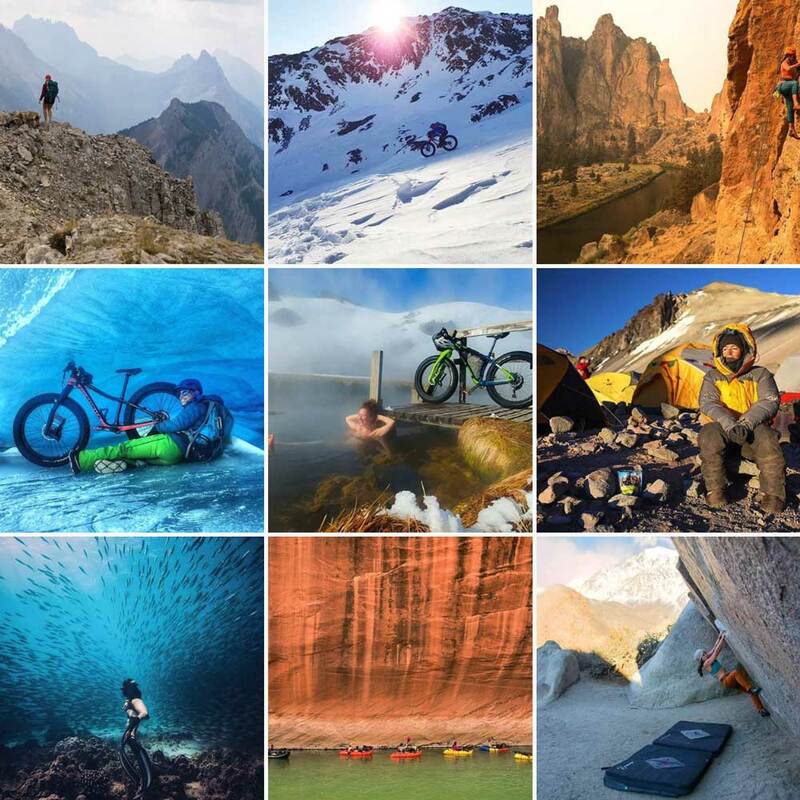 How many people do you know who ride their motorcycle to ski big mountain lines, then hop on a plane for a monthlong trip around the world? I know of one. 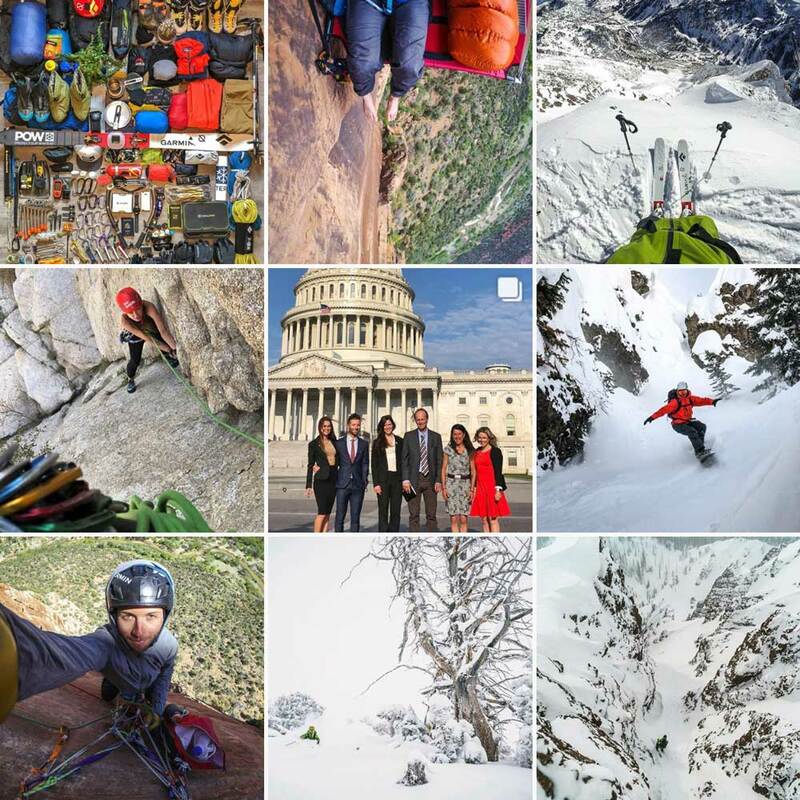 Her journey adds an undeniable element to outdoor Instagram — one that is delightfully undefinable. @missholldoll is a weekend warrior who makes it happen. As I write this, it is Saturday morning and I don’t know if that’s because of my own poor time management or because this project is so large in scope. 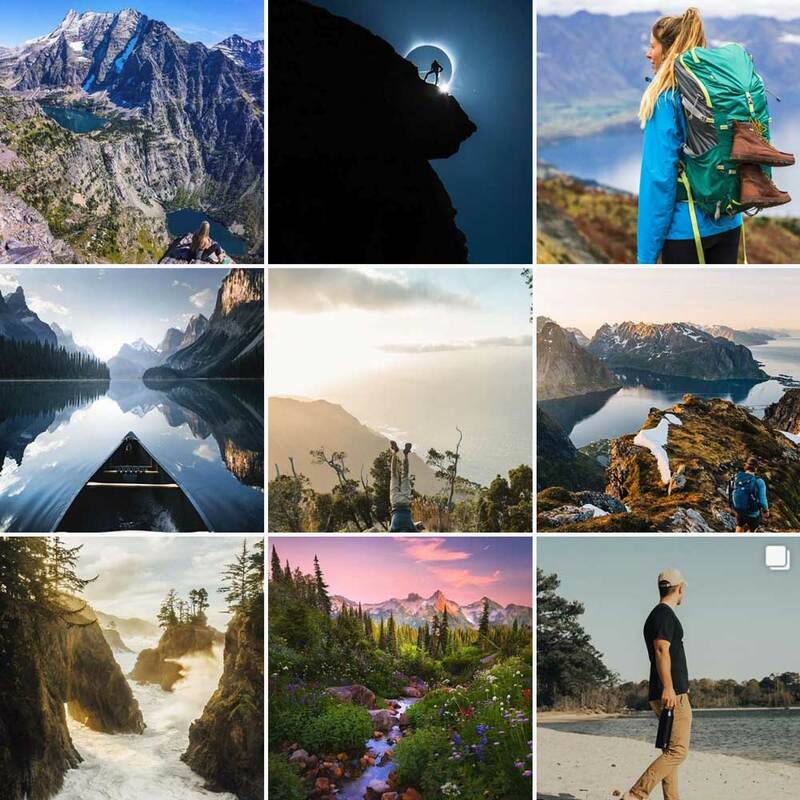 Regardless, it is in times like this I couldn’t be more appreciative to see Instagram influencers like Holly, people who remind people like me just how much adventure I can pack into a weekend. 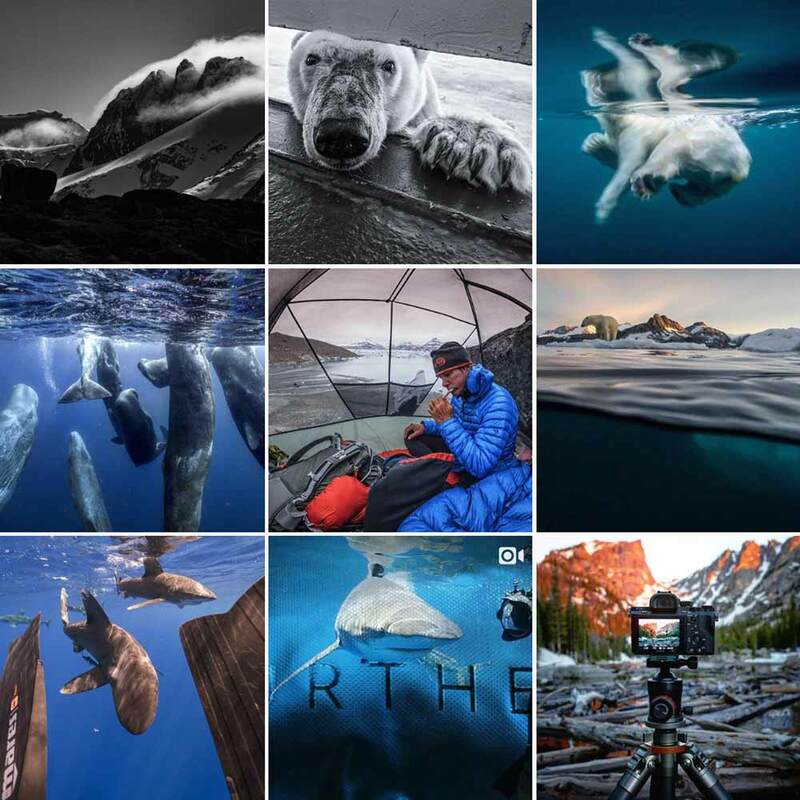 Holy manatee if you do not follow @paulnicklen stop reading this and go follow him right now. Paul’s dedication to oceanic wildlife is one of those rare passions so thick it feels transferrable through proximal osmosis. By that I mean: just by following Paul’s passion I feel capable of a new level of license for more passion in my own life. Paul’s work is art. 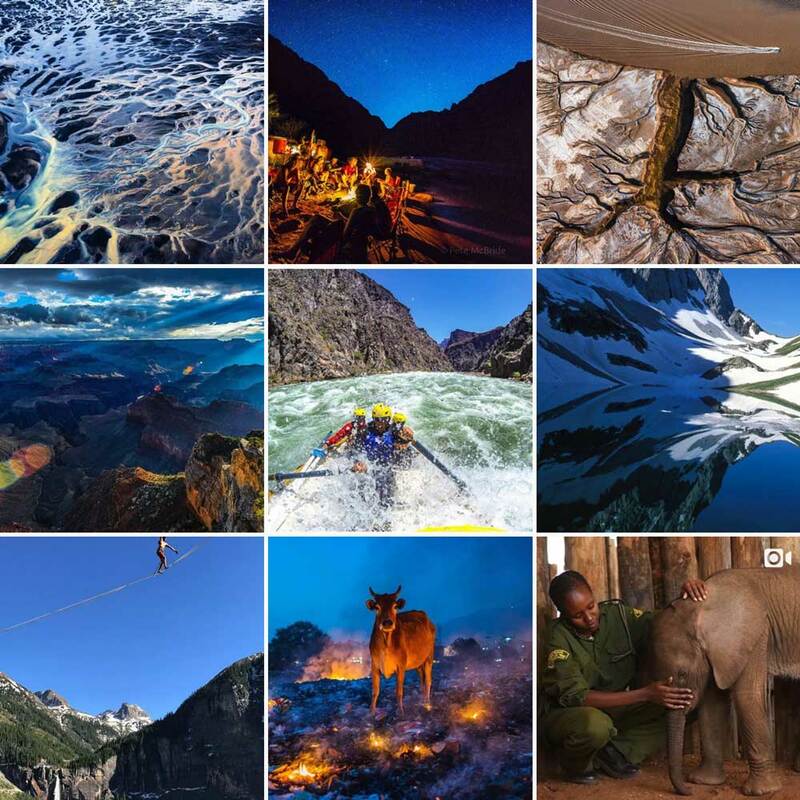 It is clear that @pedromcbride’s posts are just a fraction of what he experiences in his life dedication to wild places and wild things. More times than I can count, I have seen a photo and thought “dang.” And then it turned out to be @ryanresatka’s. 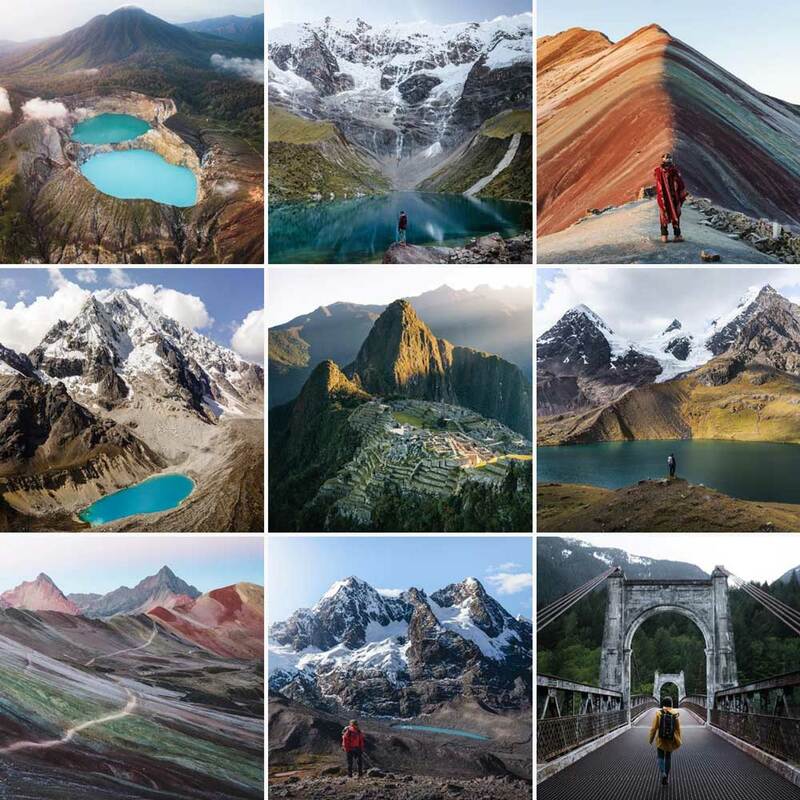 While he shares familiar feeling views, he does so with a perspective undeniably different, adding a unique and important element to outdoor Instagram. 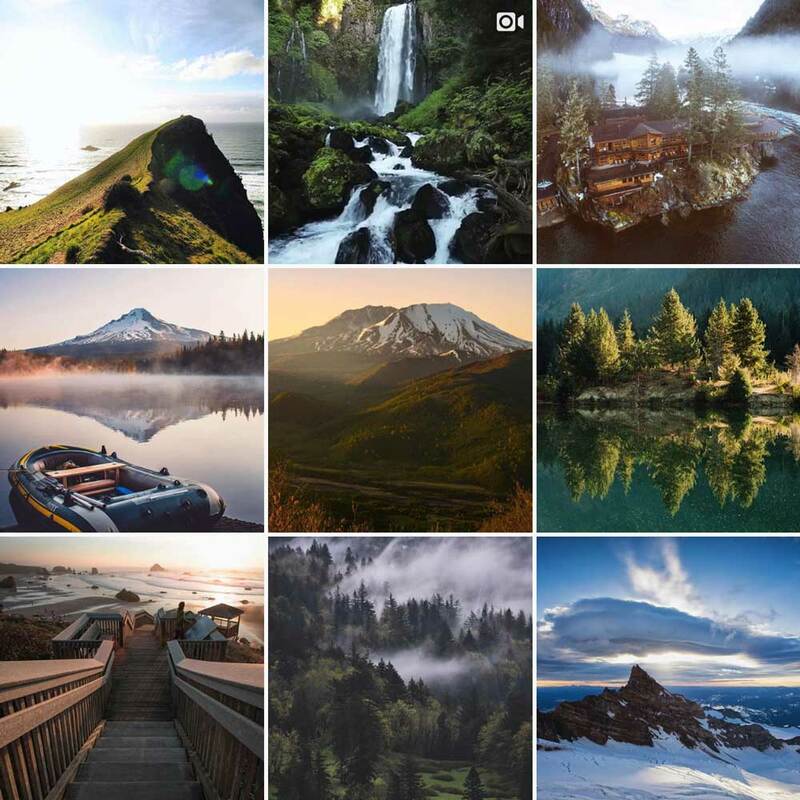 Capturing memorable moments from a region dense with natural beauty, @traveloregon is a constant source of Instagramic benevolence. 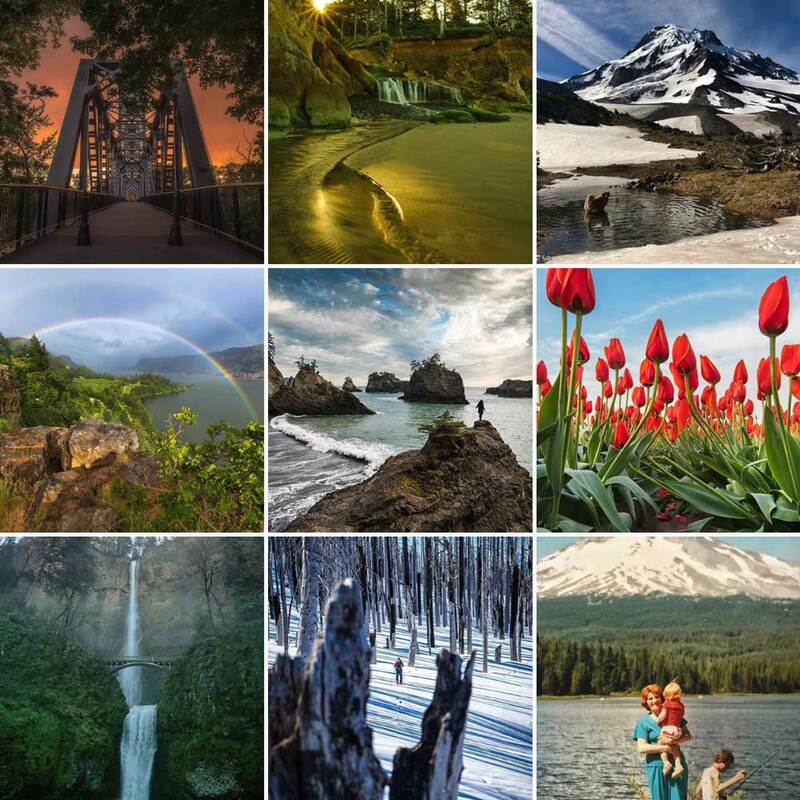 Beauty abounds in Oregon, and @traveloregen gathers it in one place. 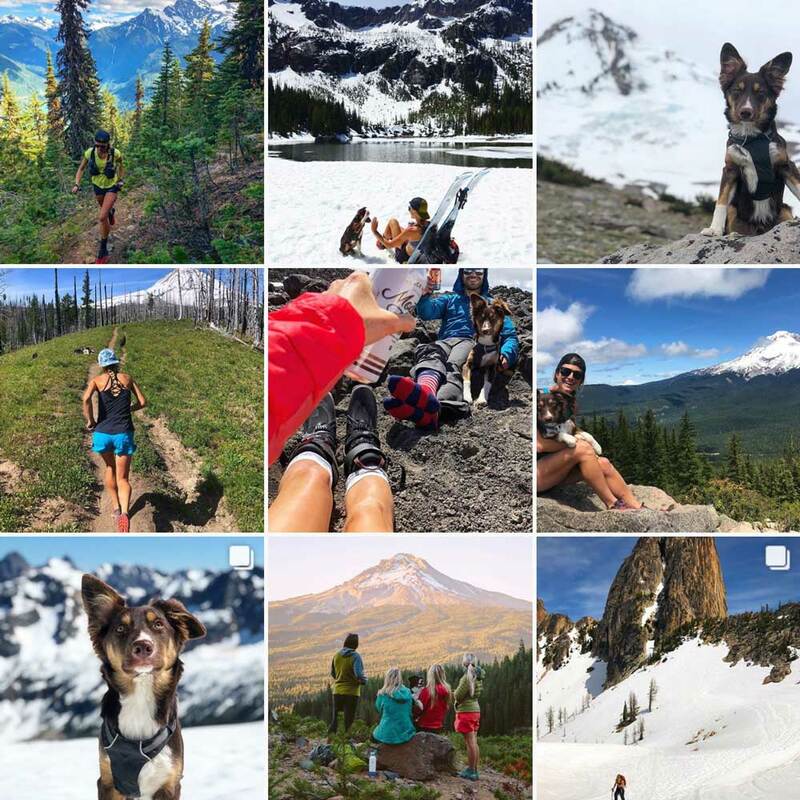 @alexborsuk’s daily adventures, often accompanied by her pup Otto, inspire thousands to live more life outdoors. Read our interview, Alex Borsuk on How to Raise and Adventure Puppy. Travis Burke is everywhere. I don’t know if it is just my feed but somehow there is a certain magnetism to what he is doing that keeps it at the surface, but I can’t think of many Instagram influencers who have this same draw. And he rises to the occasion. 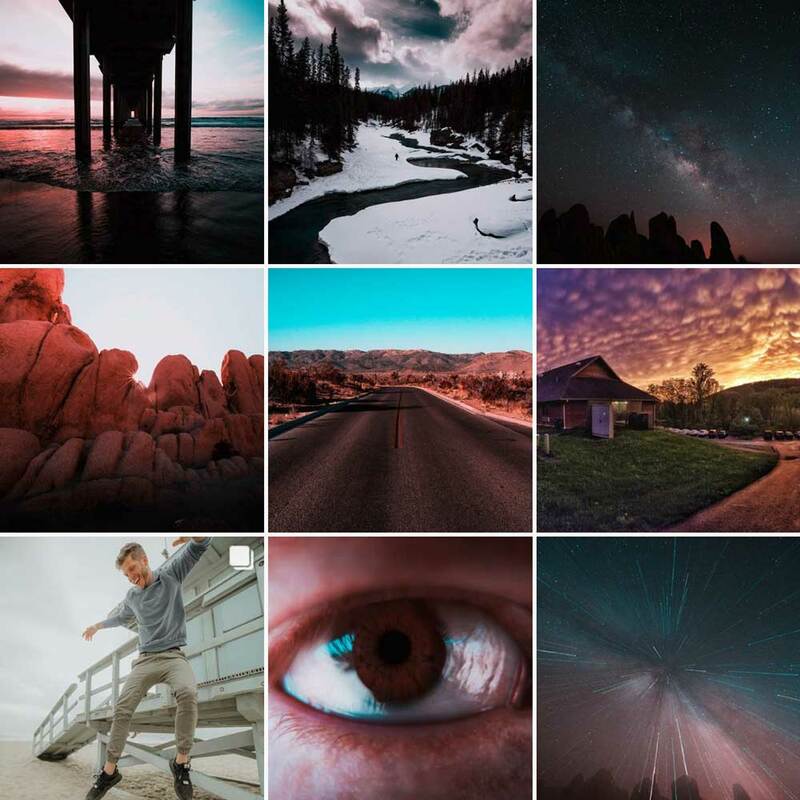 His Stories, captions, and photos together portray someone interested in the delicate balance between aesthetic excellence and raw experience. 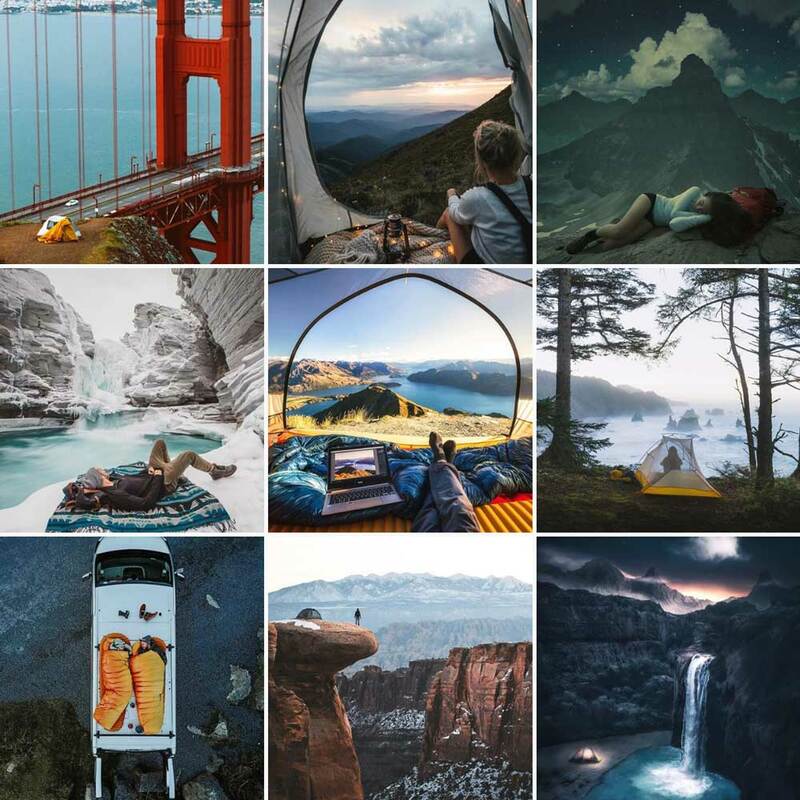 These are the kind of photos that have inspired so many people in the outdoor industry to pursue #vanlife — but don’t be fooled. The captions from @wheresmyofficenow offer clarity and truth, beyond the cliche of Westfalias parked on beaches. 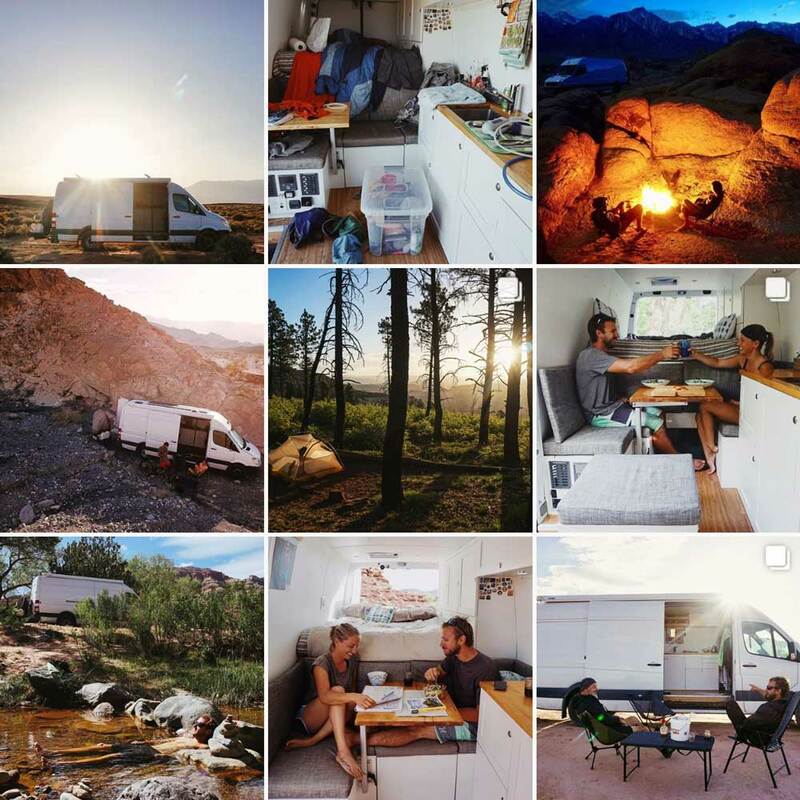 While the photos are almost always gorgeous, vanlife has its ups and down and these two aren’t afraid to talk about it. 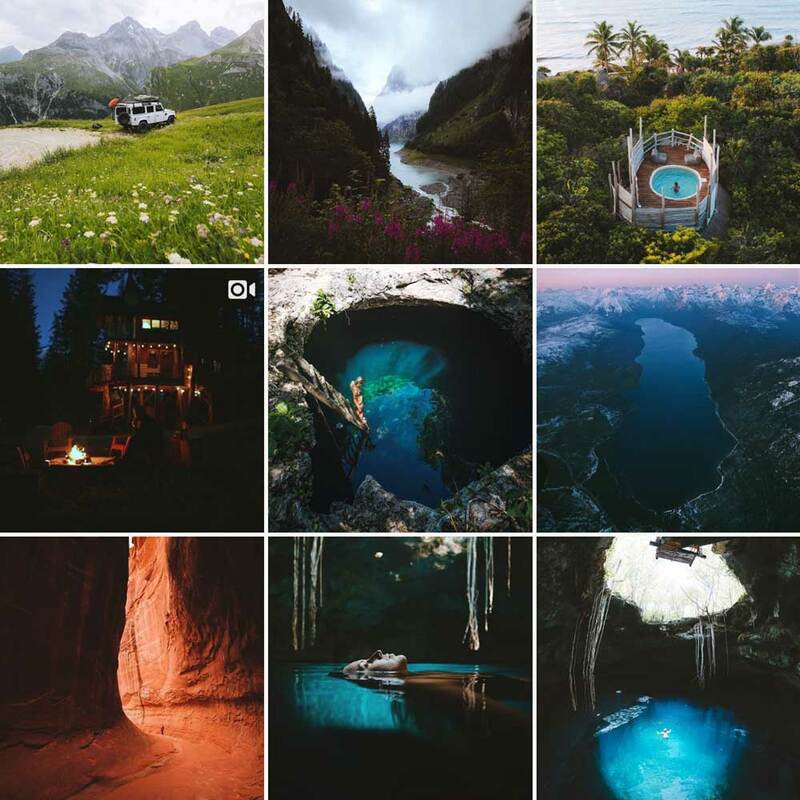 Many accounts on Instagram focus on places. 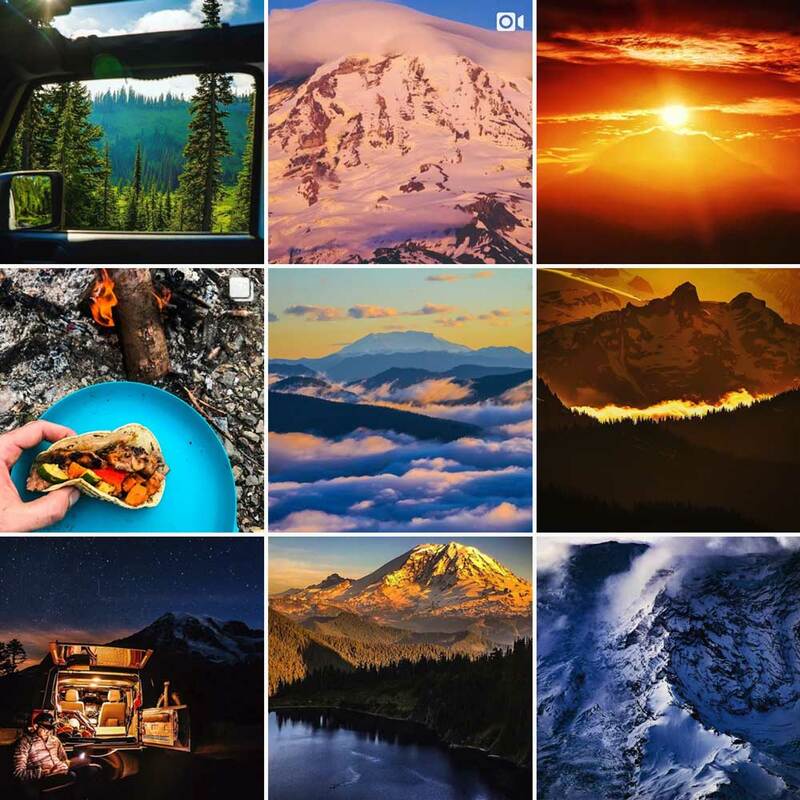 @freshoffthegrid is a champion of the fuel that keeps us going, adding a necessary flavor to the greater community. With captions that greet you like the upturned golden faces of an endless field of sunflowers, you will find delight in @idletheorybus. Sometimes life on the road is expansive desert sunsets where the dark red earth silhouettes against the maroon sky, and sometimes it’s folding chairs in the shade of the van. @lifeultralight share both types of moment. 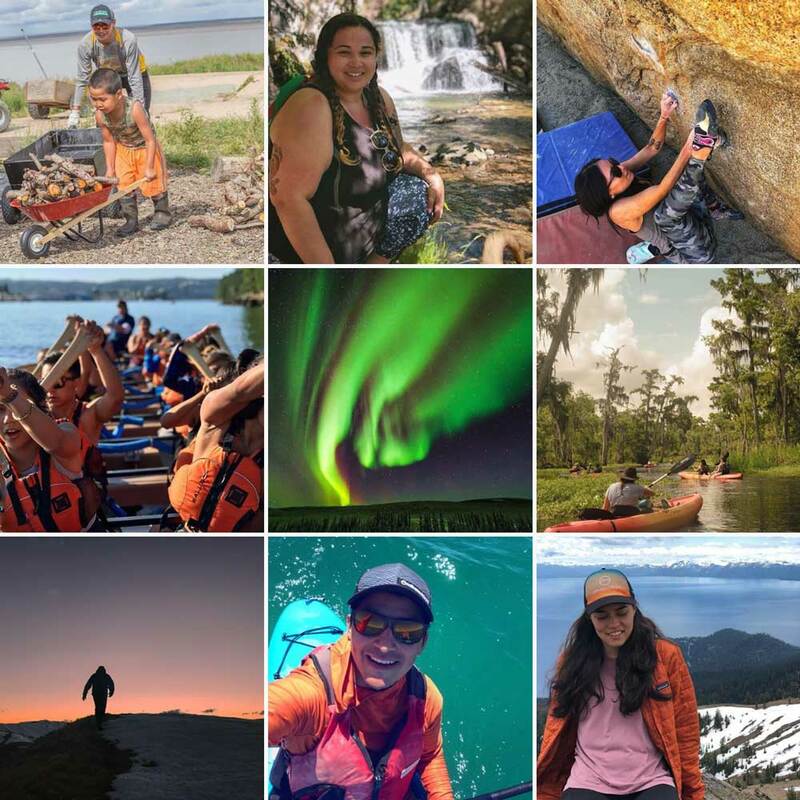 NativesOutdoors advocates for necessary voices in the American outdoor industry: the ones that were here first. 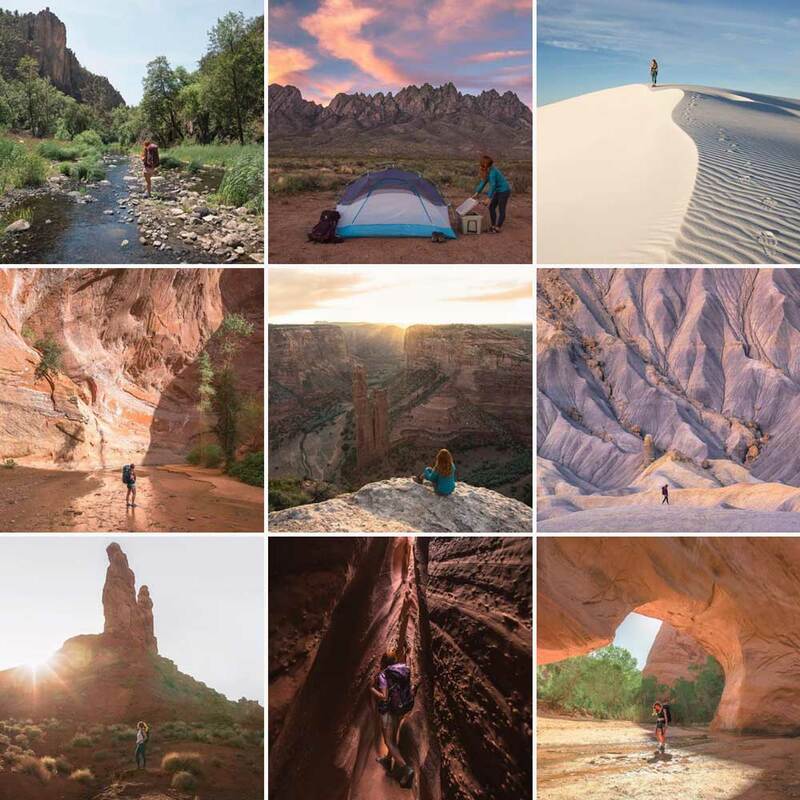 Read our interview with the founder, NativesOutdoors’ Len Necefer is Changing How We View Public Lands. Renan Ozturk is behind such cinematic feats as Meru and The Last Death-Defying Honey Hunter of Nepal. His photos and perspective have had undeniable impact on the industry. @brodyleven dreams big, then does big. It’s a pattern he’s used to, and it’s fun to watch. But more than fun, his outdoor activities are a good reminder that the “big” thing you’ve been thinking about is probably doable with enough forethought, planning, and dedication. @wilderness_culture conglomerates wonder. 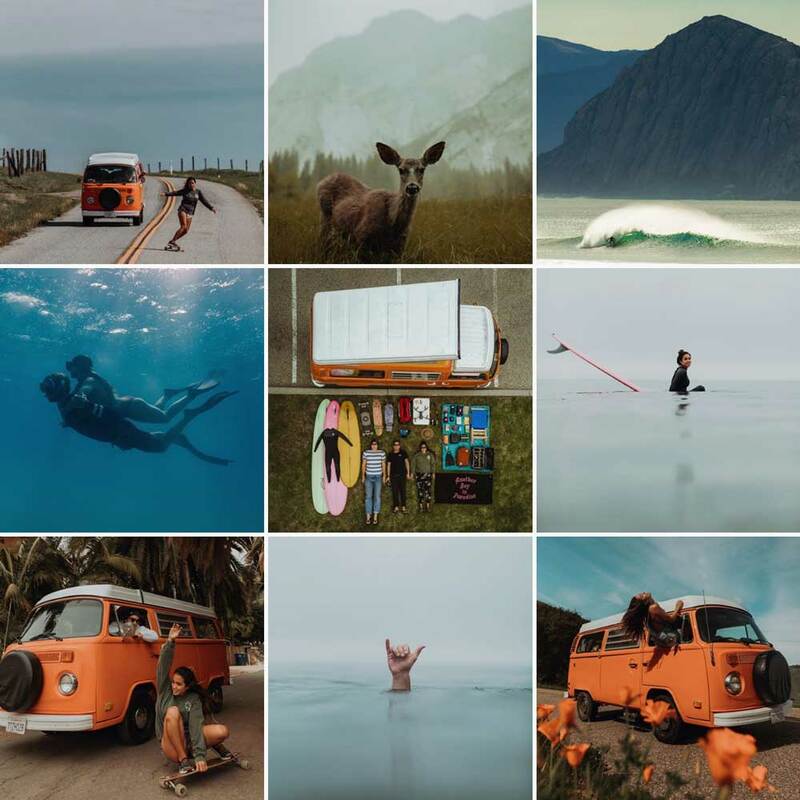 If you’re interested in discovering new people capturing the incredible, watch who @wilderness_culture features. 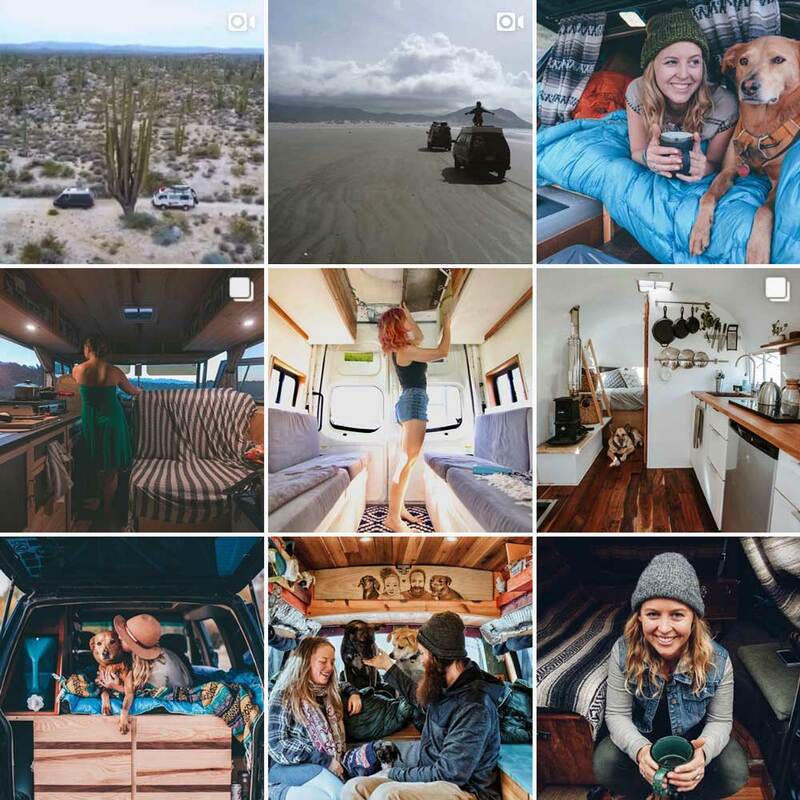 @andshesdopetoo is a celebration of adventure, balancing feel-good vibes with actionable community. Join one of their Rendezvous or Retreats to participate in the ASDT community. 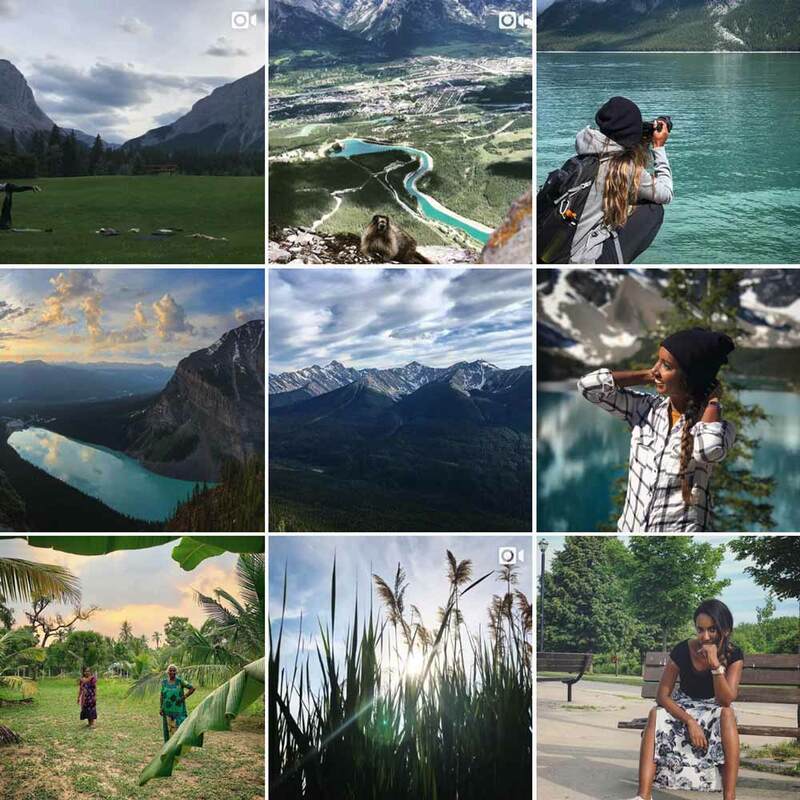 Ambreen created @brownpeoplecamping in August 2016 to give voice to minority and marginalized experiences in the outdoors, and it has taken off. She not only speaks to her own experience, she also uses her platform to amplify the voices of others. The real life of a 3-kid family in the outdoors. 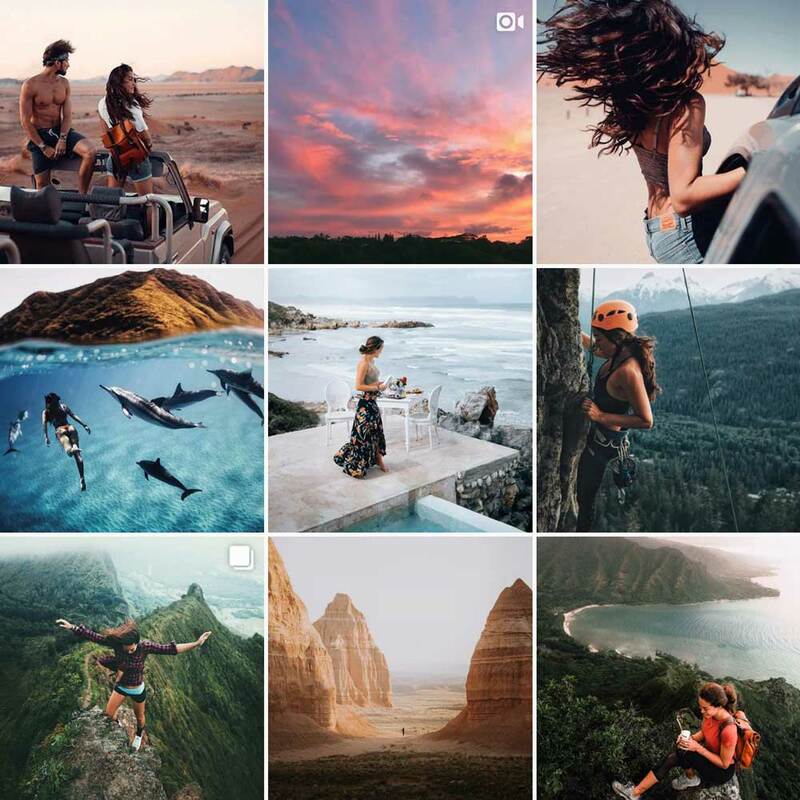 From full-time nomadic to semi-nomadic, @currentlywandering has been there, and done that, and these adorable Instagram influencers are still seeking out new adventures. Erin’s expert photography is only eclipsed by her personal perspective. 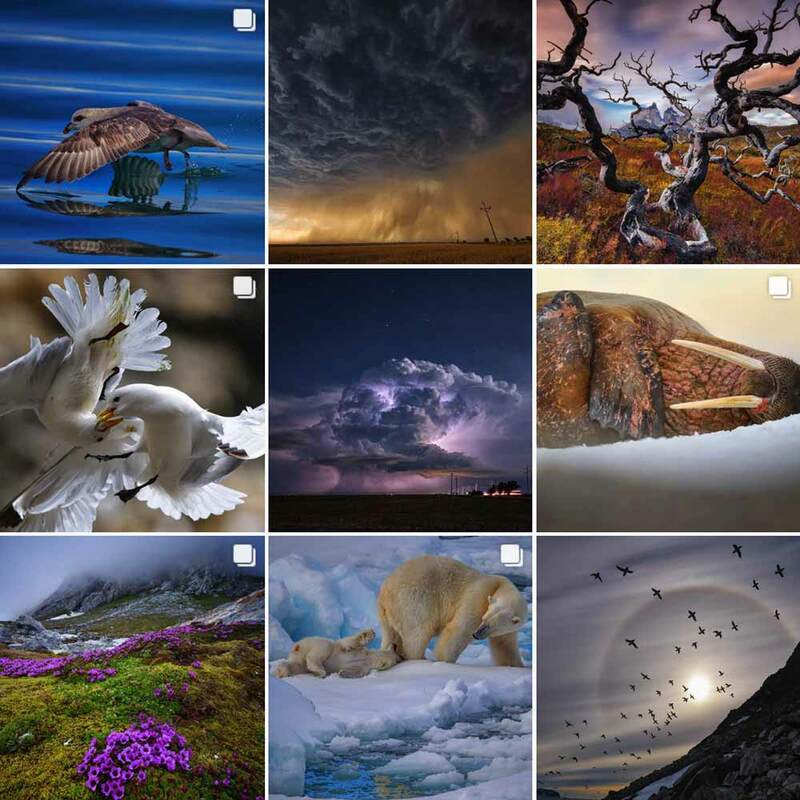 Her focus on personal growth means her profile is more than just a curated collection of stunning images; it is imbued with everblooming life. To peruse is to partake, and to walk away feeling fresher. 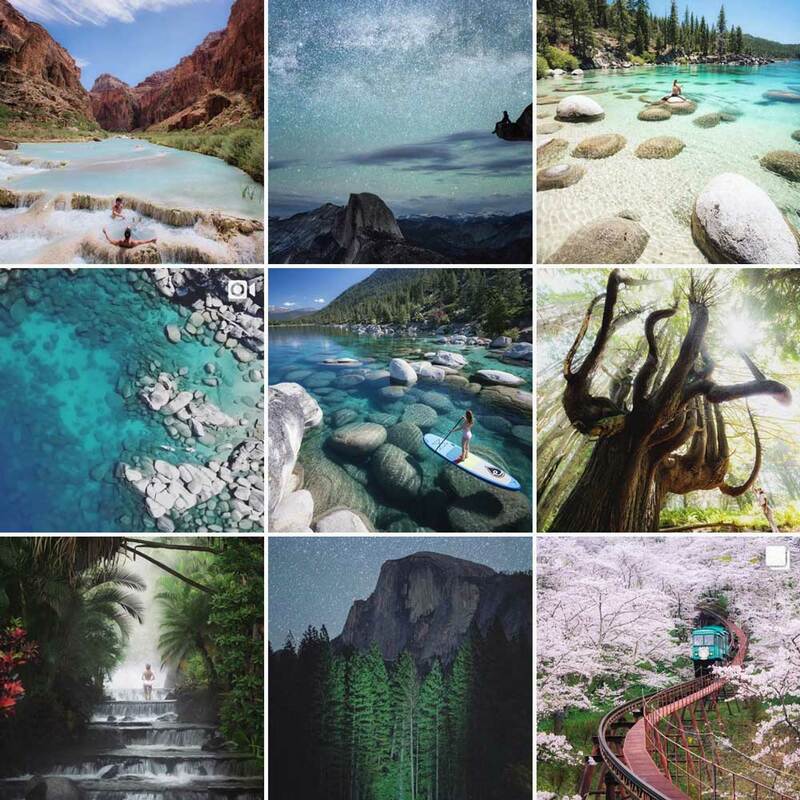 If any Instagram influencers leave an impact on you, we hope they are from this account. 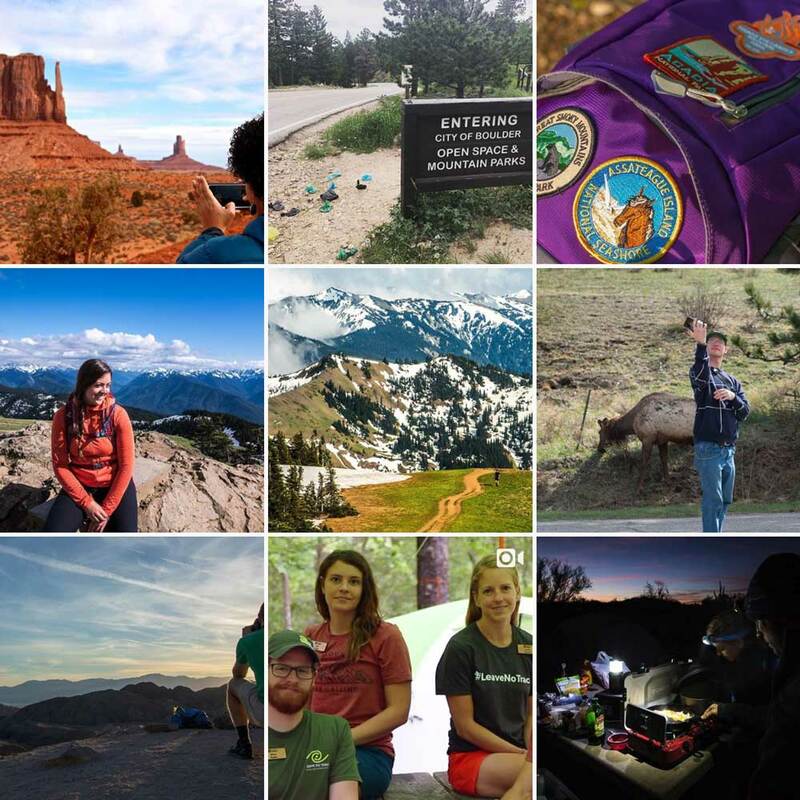 @leavenotracecenter is the official profile of the organization behind the oft-quoted Leave No Trace principles. As you get your daily nature fix from your feed, it is nice to have regular reminders of best practices and others doing well by the lands we love. 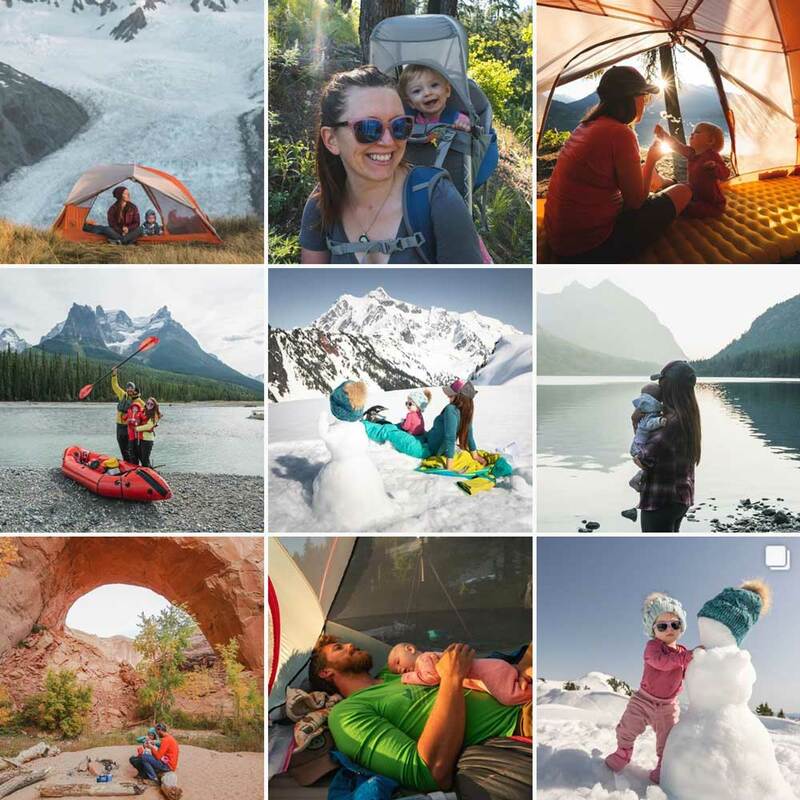 A daughter is born to two outdoor enthusiasts, who now document the process of merging parenting with their first love: the outdoors. Do you ever see couples on Instagram going on epic adventures and think, what would happen if they were to have a child? Well, @moonmountianlife is probably what would happen. 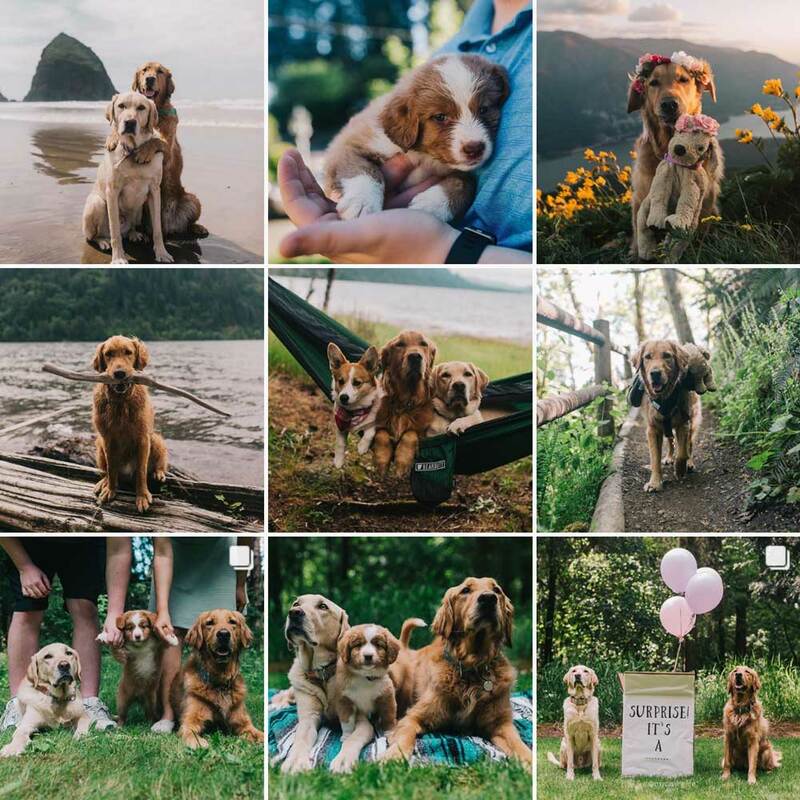 @mycaninelife is what happens when a dog trainer is also the caretaker of some of the cutest pups this side of the Mississippi. 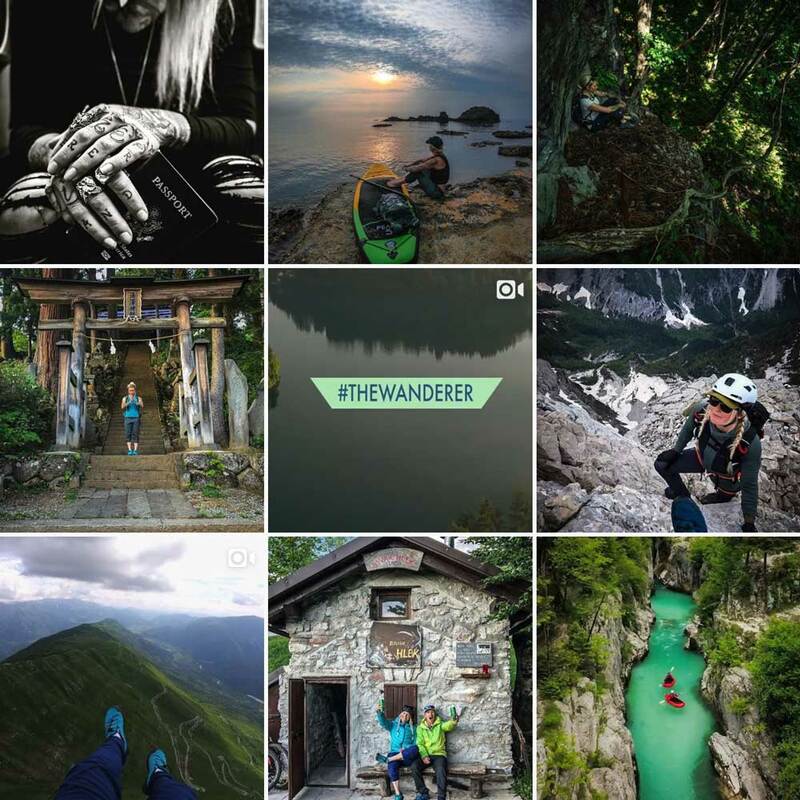 @outdoorwomen is the account of the Outdoor Women’s Alliance (OWA), a global nonprofit supporting the pursuits of women in the outdoors. @peteramend manages to present all of those things, and we love the result. 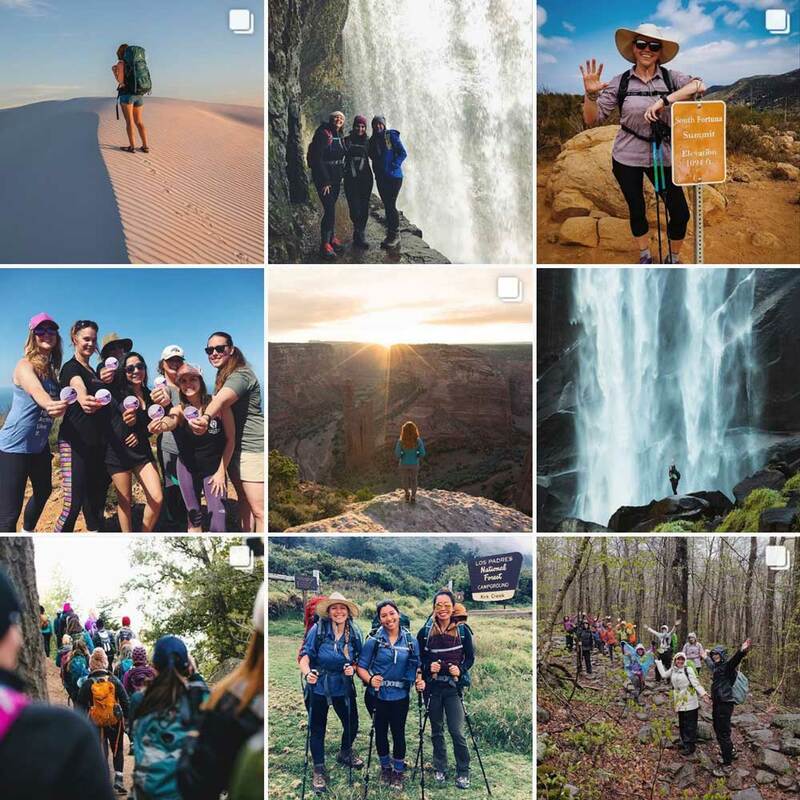 Organizing group hikes across the country, @womenwhohike is not only an interesting follow, they’re an actionable community of Instagram influencers you can hike with every month. 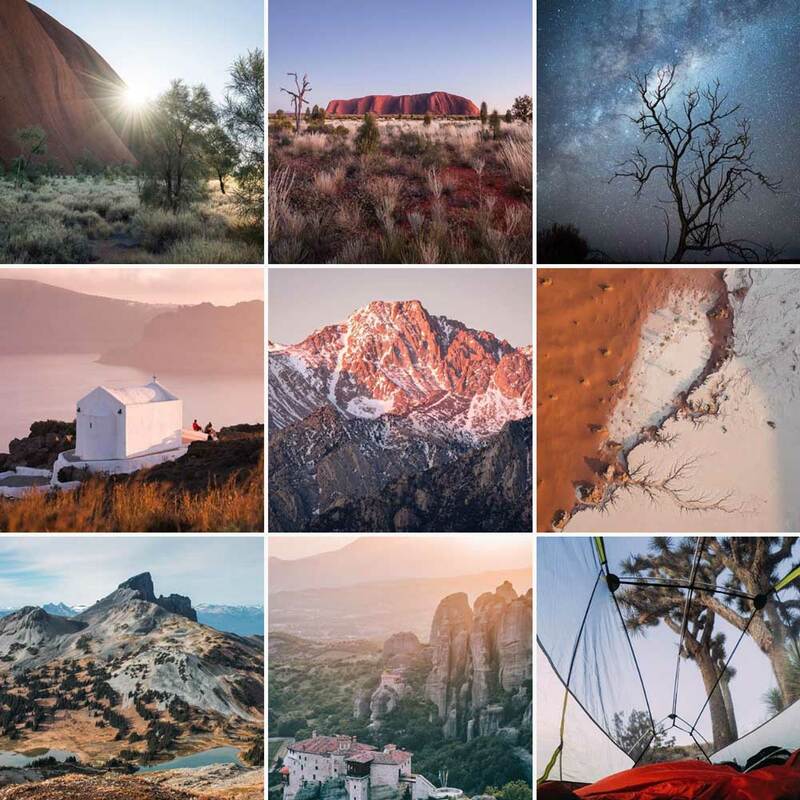 @pete_alportis an up-and-coming exemplar of authentic instagramming: he does what he loves, documents it along the way, and shares others doing the same. Not everyone who lives on the road lives in a custom-kitted Sprinter van. 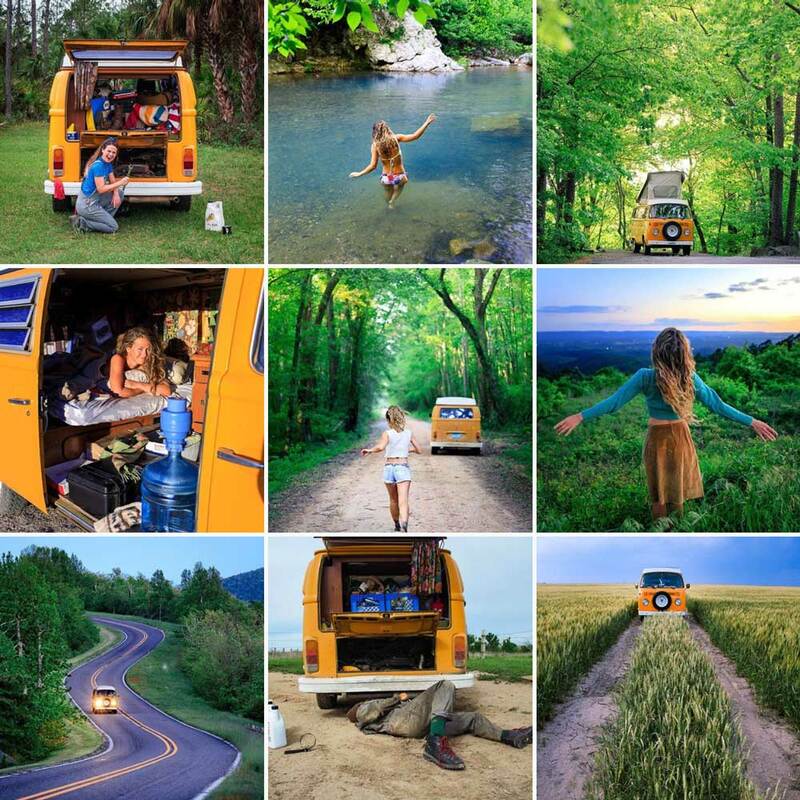 In fact, a lot of people don’t want the #vanlife. 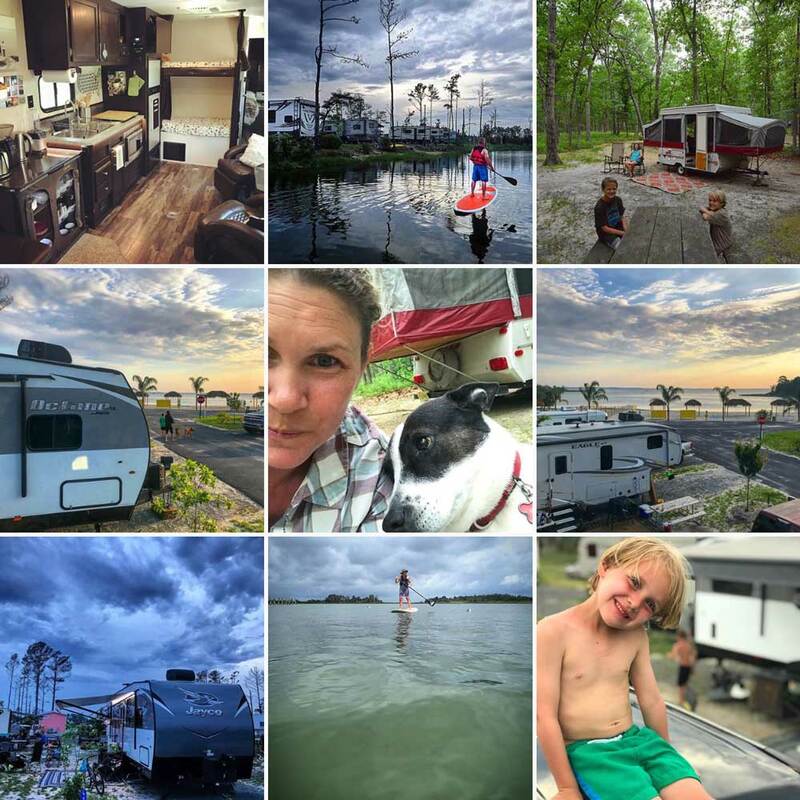 Some prefer the #rvlife, like @rvfamilytravelatlas, who is documenting their journey across highways and through parenting. 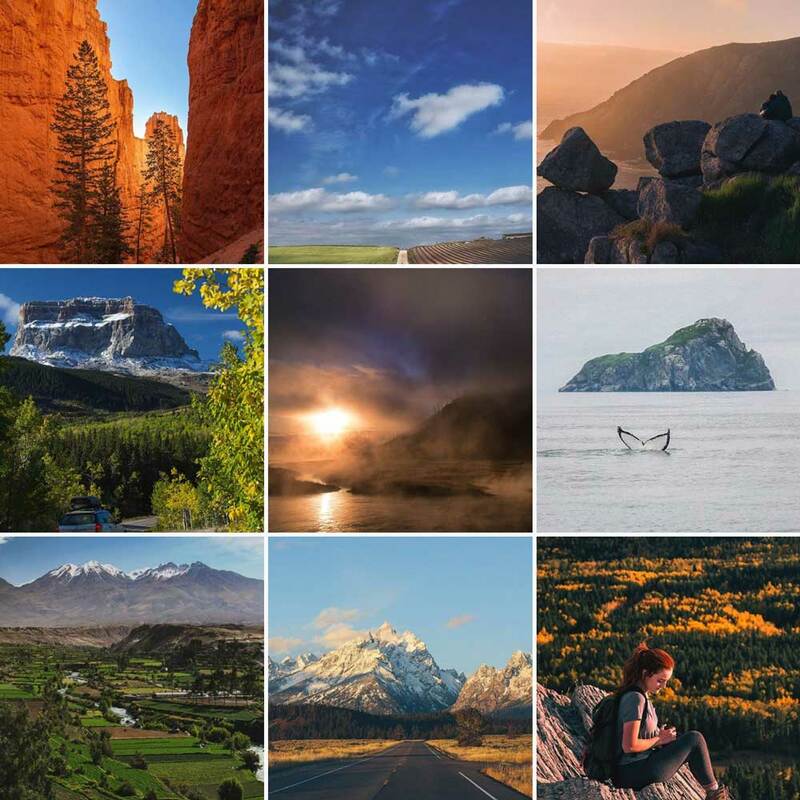 Stories inspired by the outdoors, the road, and life. 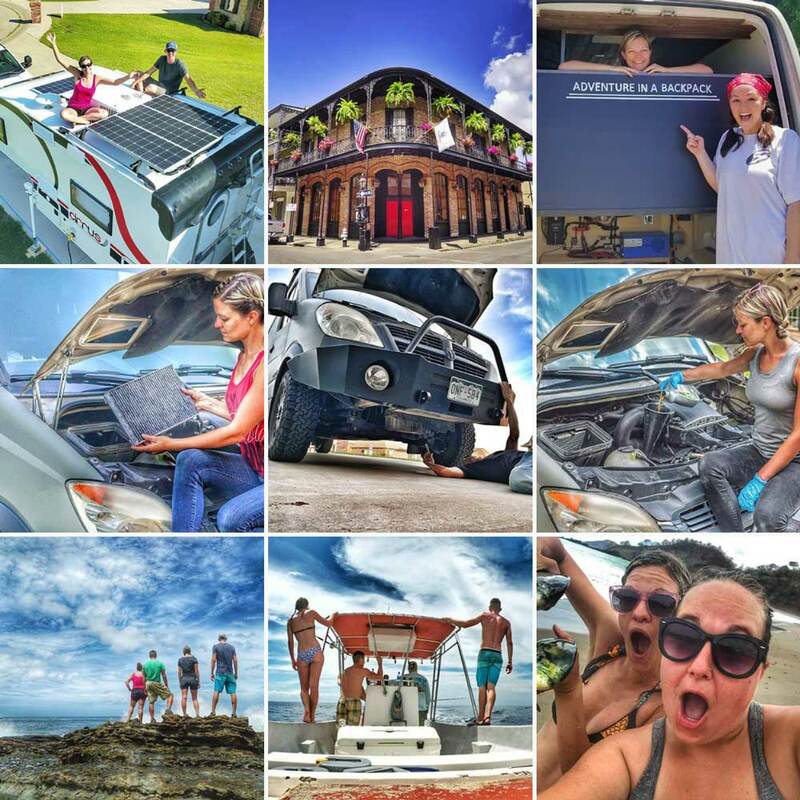 * Listen to our two podcasts: She Explores and @womenontheroad * #sheexplores * Links below! 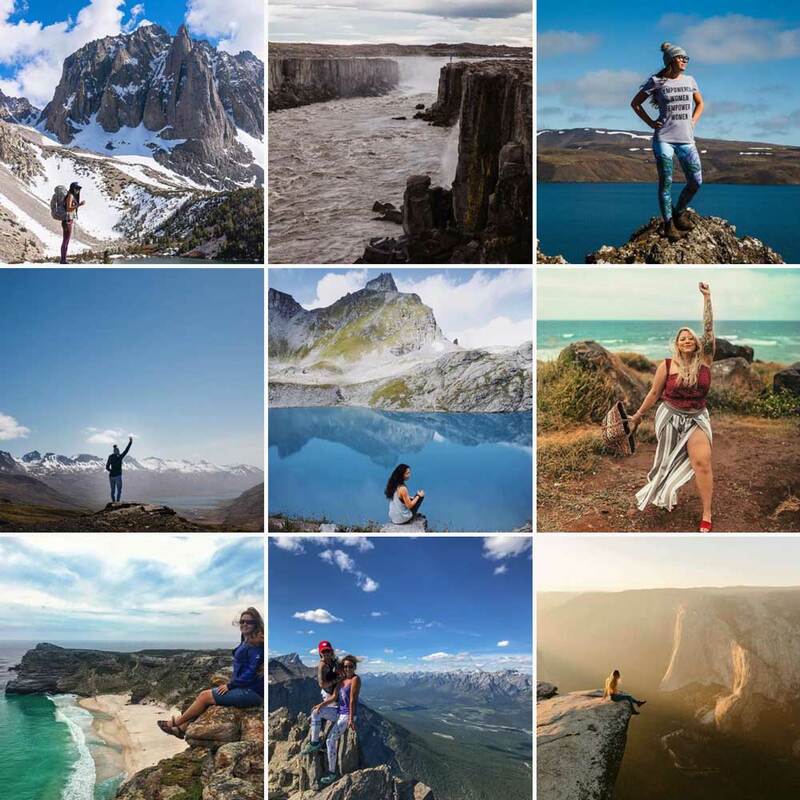 @she_explores is a wellspring of authenticity, using their spotlight to feature stories from countless adventurers making their way through the world. 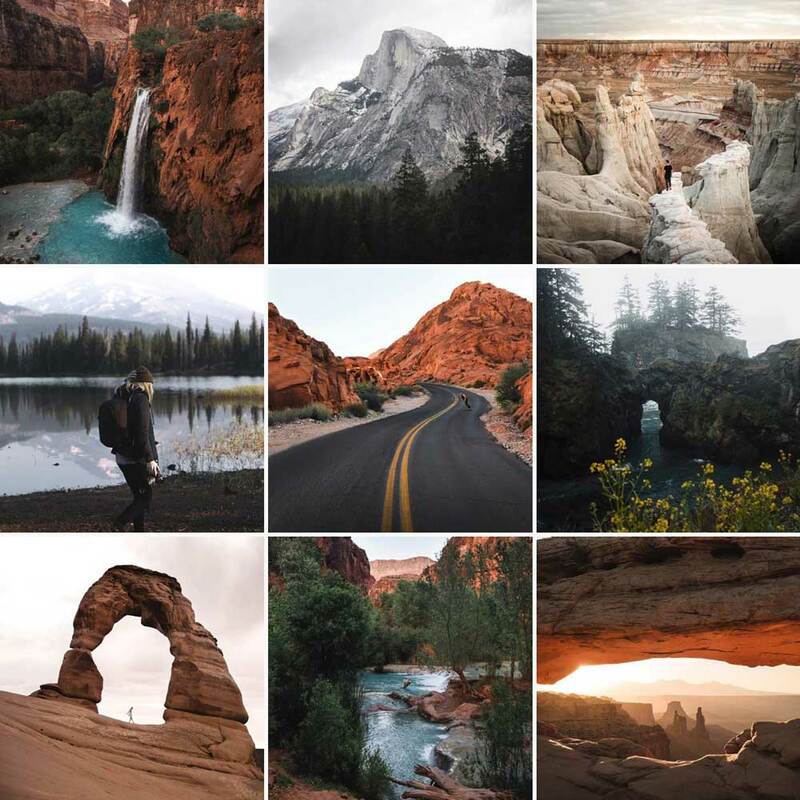 With an evocative twist on iconic outdoor imagery, @theamericanroadtripper’s tones cannot be ignored. 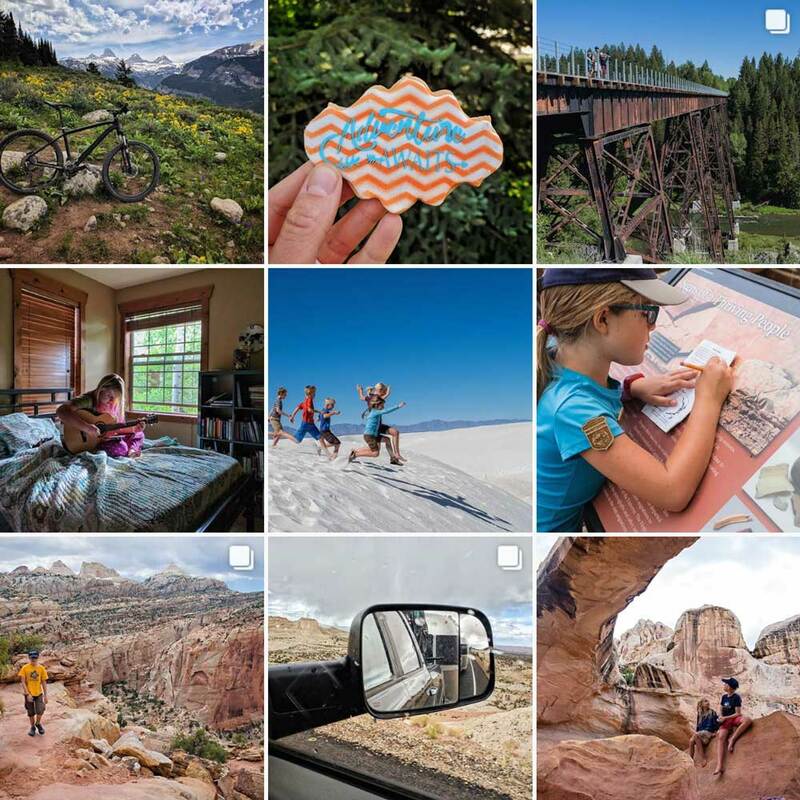 Each photo tells its own micro story of life on the road. 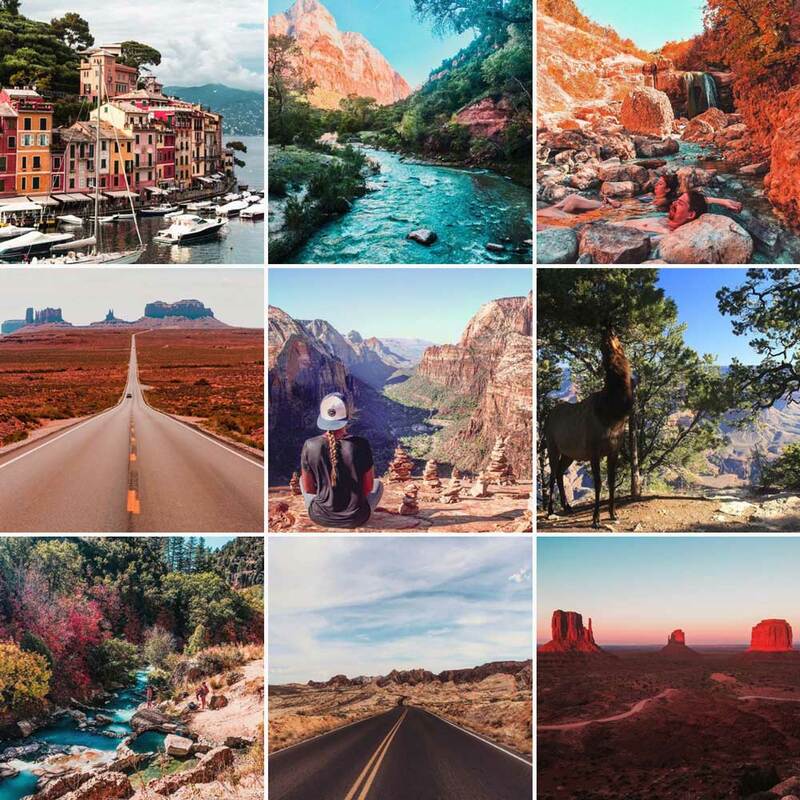 Together, @theamericanroadtripper’s story is a good reminder of the fantastical experiences only a good road trip can provide. 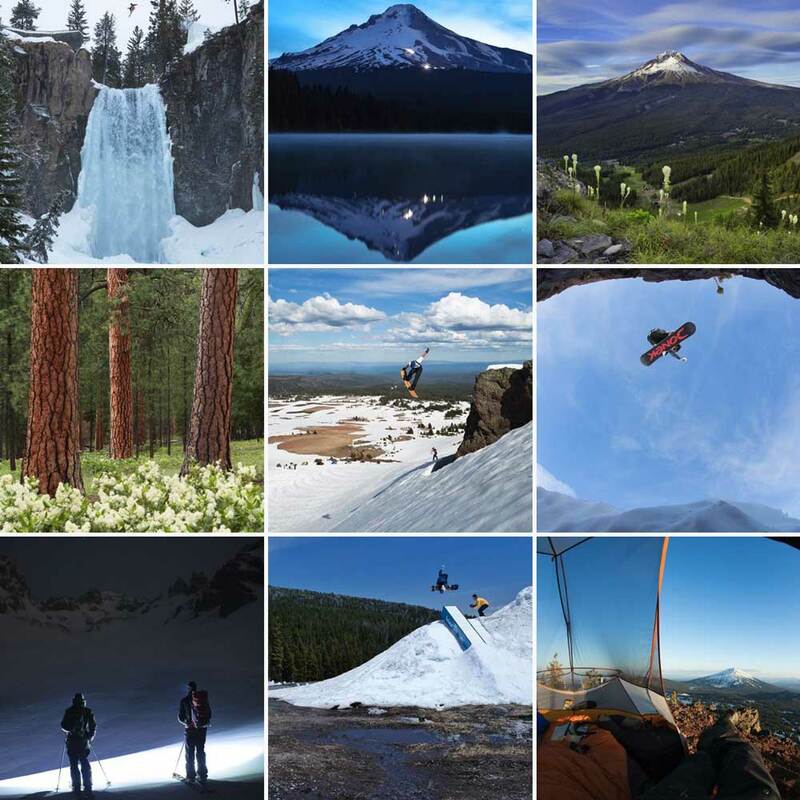 What is it about Bend, OR that has everyone in awe? Perhaps it’s the high concentration of outdoor attractions. Perhaps its the high concentration of outdoor-loving people. Most probably, it’s both. And @thebestofbend captures it admirably. 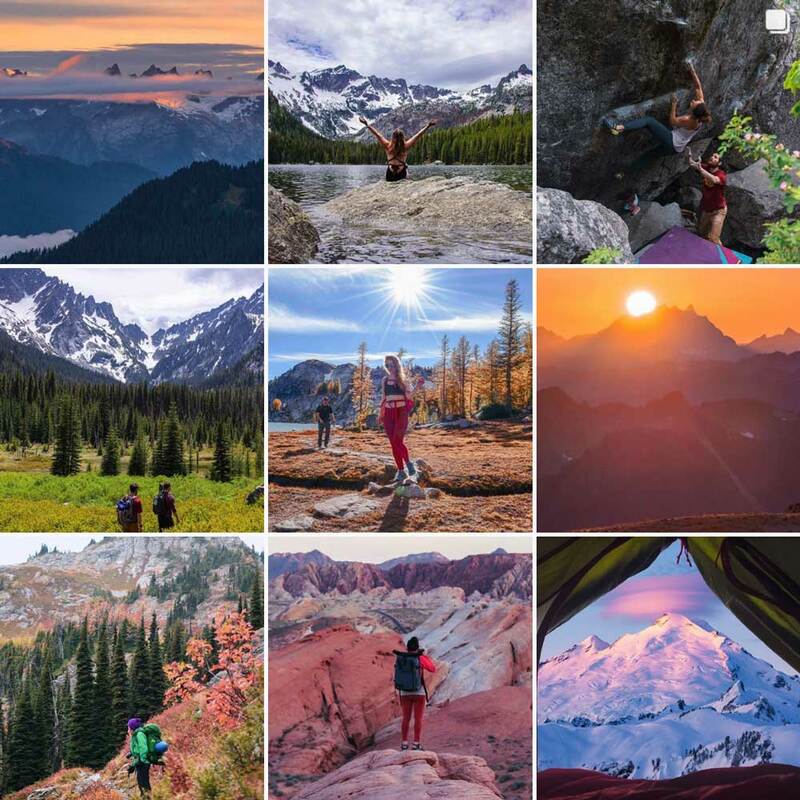 @womenwhoexplore’s bio says it all: your daily dose of empowerment through celebration of women in the wild. 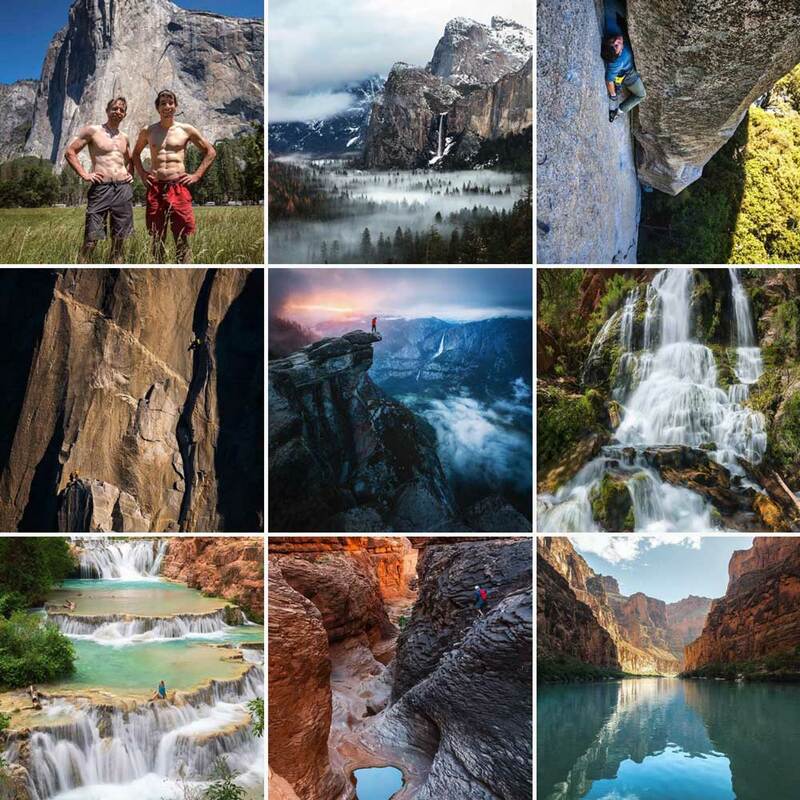 @ladzinski’s posts contain magic, the same magic you’ve felt at the foot of a massive mountain or at first glimpse of a raging waterfall. They capture wonder. And the effect is a brief, rare moment: an opportunity to reflect on that magic, to recall instances where you’ve felt it before, to appreciate its presence in his post, and to seek out more magic. 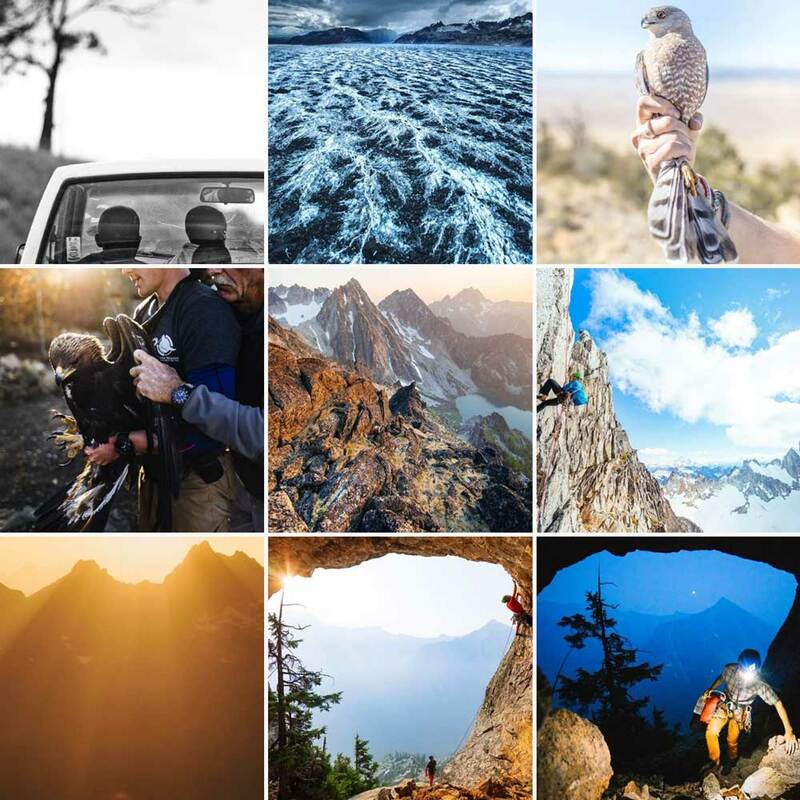 @andy_mann has dedicated his life to the great outdoors, and his passion for preservation comes through in every post. May we all find purpose in our lives like Andy has found in his. 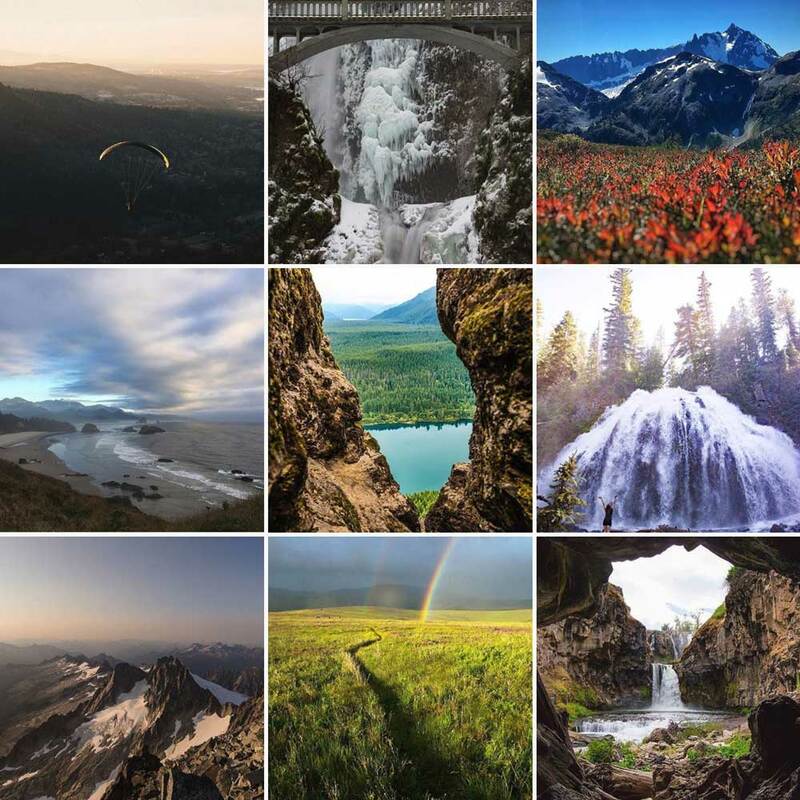 @donnyfoto is a different kind of wedding photographer: he goes with his clients into the backcountry to capture lifelong moments in timeless locations. @thurka has visited more than 150 cities/regions and 20 countries. She’s produced, directed, and written content for everything from national TV spots to private corporations. 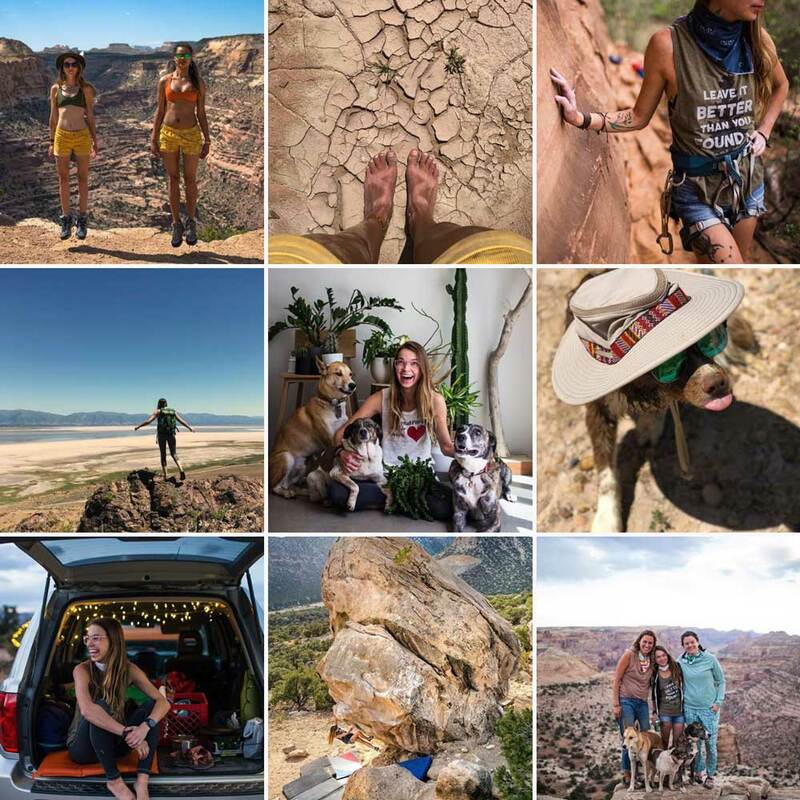 But it’s what shines through all the content that matters most: her relentless dedication to the outdoors as an avenue for self and community growth. Thanks to Reed Huston and Megan Walsh for aiding in research.